Gloucester Athletic Club’s Alex George brought the curtain down on an extraordinary year with a flourish. Competing in the 55th running of the famous ‘Nos Galan’ Elite 5km New Years Eve road race in Mountain Ash, the City youngster placed 4th overall and first Junior Man in a high class field that included many of the best road runners in England and Wales. George’s time of 15:00 (he was actually timed at 14:59.98, which was rounded up0 was a new Gloucester AC junior club record, eclipsing the previous record (16:31, held by Simon Kellie) by over one and a half minutes. George’s coach, Paul de-Camps, said “Alex has had an exceptional year on the country and track this year and with his first GB junior international less than two weeks’ away, we thought it would be nice for him to show his worth on the road before the year end.” This result came on the back of George’s England debut, when he took an excellent 15th place in the Lotto Cup international cross-country event in Brussels. Training partner, Richard de-Camps, like George, also competing in his first individual road race of note, placed 11th overall in the senior men’s category to draw another highly consistent year to a close. Gloucester Athletic Club members competed in the recent Seven Sins multi-terrain events over a series of testing hills over a seven-mile course in the Forest of Dean. Max Sheppard completed the course in 61:49, Colin Westbury recorded 68:42, Sue Higgins 68:56 and Denise Evans 76:17. Gloucester Athletic Club’s Richard de-Camps won the annual Forest of Dean Christmas Tree race for the third consecutive year just before Christmas. The course had been extended this year and, despite thigh-deep water and relentless muddy conditions, de-Camps dominated throughout and came home 5 minutes and 20 seconds ahead of the second-placed runner. At the Rudolph’s Rampage 7.1km Fancy Dress festive event in Painswick on Sunday (15th), Gloucester Athletic Club’s Simon Fortnam dressed in an Elf’s costume took 2nd place. Newcomer Kirsty Branch placed 24th overall and second lady to earn her first multi-terrain prize. Rob Jordan placed 42nd and Sharon Harris 169th. Gloucester Athletic Club sent a second-string squad to contest the latest fixture in this season’s Gloucestershire Cross-Country League over a tough course on the Malvern hills on Saturday (14th). Steven Haines continued his return to regular racing by leading the team home in 42nd place to show he is gradually regaining the form that made him a consistent scorer for the senior team two seasons ago. Newcomer James Head was the next City man home in 70th, an improvement of 60 places on his last outing, with Max Sheppard placing 85th to show he is gradually returning to form following a long injury lay-off. Arthur Daley placed 94th overall and 2nd in the M60 category, whilst Rob Jordan (150th) and Clive Poole (163rd) both improved over 50 places on their previous county league races to complete the scoring six. The small Gloucester contingent was completed by M65 Chris O’Carroll in 180th place. The Gloucester club’s ladies team continued their resurgence by once again fielding a complete squad. Beryl Sampson led the way, finishing in 16th place overall, followed by Sue Higgins in 26th and Nicola Hovey in 34th. Emma Jeffery placed 38th. Gloucester Athletic Club’s junior cross-country runners travelled up to Malvern to compete in the latest round of the Gloucestershire Cross-Country League fixtures. Pride of place went to Bethan Moor who took an excellent 3rd place in the U15 Girls event, the highest City placing on the day. The U13 Girls event saw two City girls finish in the top 10 as Laura McPeake placed 4th and Briony Bishop 8th. The club’s youngest competitor, Lucy Jeffery, placed 38th in the U11 Girls race. In the U15 Boys race, Harry Wells took 26th place and Andrew McPeake placed 29th. 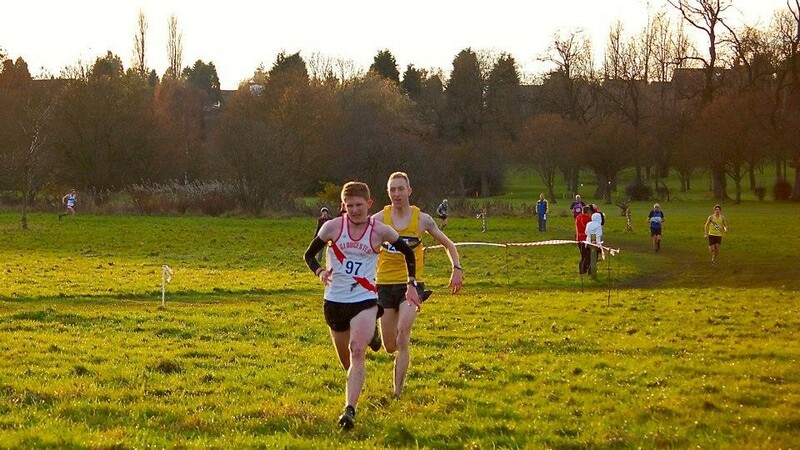 Gloucester Athletic Club’s Alex George completed a remarkable week when he secured a narrow win in the second of this season’s Birmingham Cross Country League fixtures at Nuneaton’s Burbage Common on Saturday (7th). The win came just days after the Gloucester youngster had been selected to represent the England U20 team in the Lotto Cup Cross Country international event in Brussels on 22nd December to earn his first international vest, where he will be competing against runners two years older than himself. In Saturday’s race, George again used his proven tactic of settling in the leading group for two thirds of the race before gradually winding up the pace and unleashing a strong finish to finish four seconds clear of second-placed Chris Perrin of Cannock & Staffs and a further five seconds ahead of third-placed Richard Harper of Leamington Spa. George’s training partner, Richard de-Camps, produced a strong performance to place fifth, an improvement of five places on the first fixture, while another member of the Paul de-Camps stable, Paul Barlow placed 43rd. Next to finish for the Gloucester team was Simon Fortnam, in 51st, with Lee Smith (67th) and Jeremy Mower (80th) bringing the ‘A’ team home in sixth place overall on the day. The City club’s ‘B’ team was led home by Steve Haines in 97th, followed by Tom Randles in 120th. Arthur Daley (126th) held off spirited challenges from Ian Summers (139th), Luke Herbert (153rd) and Matt Powell (163rd) as the reserve squad placed 4th among the ‘B’ teams. Simon Barnes placed 202nd of the 281 finishers to complete the Gloucester contingent. Gloucester Athletic Club’s youngsters were in action at the Gloucestershire Schools Cross-Country Championships at Plock Court on Saturday (7th). Dominic Tutton achieved the highest placing when he took second place in the Senior Boys event. Bethan Moor placed fourth in the Inter Girls race, with Heather Christie placing 33rd and Abi Pearce 36th. Will Staddon took fifth place in the Inter Boys race. Harry Wells finished sixth in the Junior Boys race, whilst in the Minor Girls race, Elissa Moor placed 28th. 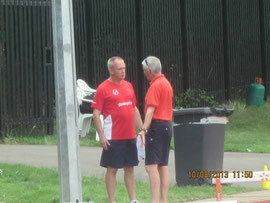 Gloucester Athletic Club’s Mike Mansfield was a clear winner of the latest Newent Parkrun event (7th), clocking 20:18. Clubmate Dave Spackman was 11th in 23:44. Sue Higgins ran the Colwick event in Nottingham and clocked 21:43 for 17th place. Gloucester Athletic Club’s Wayne Mayer and Colin Westbury travelled to Dorset to compete in the Jurassic Coast Half Marathon, which is actually run over 16 miles. 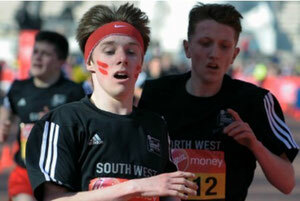 Mayer placed ninth of the 337 finishers, in 2:34:36 whilst Westbury placed 163rd in 3:25:40. In the November running of the Pomphrey Sports 5km winter road race series, Arthur Daley placed 40th overall and second M60 in 19:08, his fastest time for over two years and a two minutes improvement since returning from injury in the summer. Club newcomer Kirsty Branch (19) placed 76th in 22:16, a new personal best by two minutes, whilst Nicola Hovey placed 78th in 22:24, her second fastest ever clocking over the distance. Gloucester Athletic Club’s Anna Robertson rubbed shoulders with the likes of British & Irish Lions head coach Warren Gatland and four-time Olympic champion Sir Ben Ainslie after she was nominated for a prestigious prize at the UK Coaching Awards in London. Robertson, 24, was nominated as a West Midlands regional finalist for Gillette Community Coach of the Year in celebration of her efforts with Herefordshire Cricket and volunteer work in athletics and netball. It is not the first time Robertson has been honoured this year – having received an award from England captain Alastair Cook in October for her outstanding contribution to cricket development in her native Herefordshire. At the Cheltenham 5km Parkrun event on Saturday (30th), Gloucester Athletic Club’s Matt Powell placed 18th in 19:28 whilst at the Newent event, youngster Briony Bishop continued her impressive series of results when placing 3rd in 22:16. Rob Jordan placed 7th in 23:33. Three of Gloucester Athletic Club’s middle distance runners travelled north to Sefton Park, Liverpool for one of the major domestic cross-country events in the winter calendar. The Liverpool Cross Challenge event doubled as British Athletics’ trial race for the European Cross-Country Championships with up to 6 athletes being selected to represent the British teams in Belgrade next month. Alex George entered the U20 Men’s race with an outside chance of finishing in the top six and produced a typically gutsy performance. Despite an early tumble which caused him to lose ground on the leading group, he made his way through the field on the second and final lap, gaining a number of places before producing his trademark strong finish to claim a highly creditable 8th position in his first year in the age group. Although finishing just 9 seconds away from a position on the Great Britain junior team for Serbia, this performance should improve the Abbeymead youngster’s prospects of earning international recognition later in the cross-country season. Also in the U20 Men’s race was Alex’s twin brother, Thomas, who also performed strongly. Wisely sitting off the lead group, he used the second lap to surge through the field, picking off runners as they tired from the fast early pace and soft underfoot conditions. Thomas finished strongly claiming 25th position to put another solid cross-country performance under his belt before he turns his attention to his more favoured indoor racing in the New Year. In a highly competitive Senior Men’s race, Richard de-Camps went up against the UK’s top distance runners and employed the same tactics as his younger training partners by starting off steadily before moving through the field. De-Camps progressed his position throughout the race to produce a much improved performance on his previous cross-country outing at the Birmingham League event at Leamington Spa two weeks ago, eventually placing a respectable 118th of the 500 starters to round off a good day for the Gloucester trio. Gloucester Athletic Club members were in action in Parkrun events across the county at the weekend. At Cheltenham, Matt Powell placed 9th in 19:10 whilst juniors Jude and Imogen Dowdeswell both reduced their personal bests. Jude, clocking 23:08 in 67th place and Imogen 30:54 in 166th. At the Newent event, Mike Mansfield clocked 22:01 in second place, Beryl Sampson placed 8th in 23:02 and Rob Jordan placed 14th in 23:10. Gloucester Athletic Club’s Simon Fortnam has been in a rich vein of form this autumn and on Sunday (17th) he ran his fastest 10km for three years when placing 9th in the Swindon 10km in atime of 35:43. Club-mate Max Sheppard knocked over one and a half minutes off his personal best when clocking 40:18 for 58th place. Gloucester Athletic Club members ran in the latest round of 5km Parkrun events around the county on Saturday (16th). At the Newent event, Matt Powell, in his first race for nearly two months, crossed the line in first place in 20:56. Junior Briony Bishop set a new personal best of 22:04 in 6th, Rob Jordan placed 17th in 23:51 and Mike Mansfield 39th in 31:07. At Cheltenham, Alidia Vaile placed 52nd in 23:41 whilst Jude Dowdeswell set a new personal best of 24:22 in 66th place. Imogen Dowdeswell also set a new personal best in 165th place, clocking 31:47. 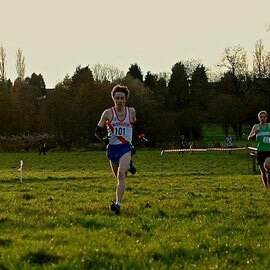 A splendid win by youngster Alex George in his first senior cross-country race saw Gloucester Athletic Club’s men secure second place in the team event in the opening Birmingham Cross-Country League Division Two race at Newbold Comyn in Leamington Spa on Saturday. Over the past 18 months, George has established himself as one of the country’s top juniors and Saturday’s race was his first opportunity to step up and pit his wits against the best senior cross-country runners in the region as all of the clubs in the Birmingham League compete against each other in this, the opening race of the campaign. A good start saw the Abbeymead youngster take early control of the field and with solid support from twin brother Thomas and training partner Richard de-Camps, the City team were in a strong position at the half-way stage. Alex crossed the line in 36:38, just seventeen seconds ahead of nearest rival Chris Perrins from Cannock & Staffs, Thomas finished in 8th place and Richard in 10th. Further back, Simon Fortnam continued his run of good form to finish in 37th, with Paul Barlow finishing in 45th and Jeremy Mower completing the scoring six in 52nd place. The team finished with 153 points, 17 behind Bournville Harriers (136). Cannock & Staffs finished in 3rd place with 180 points. The City reserves all performed well. Lee Smith led the ‘B’ team home, in 59th place, with Matt Boon placing 72nd. Steve Haines, in his first race back for the City in two years, finished just outside the top 100, in 106th, with Dave Gresswell following closely in 111th. Arthur Daley placed 134th and Ian Summers 139th to secure 3rd place for the squad in the ‘B’ team competition with 621 points. Gloucester’s other finishers were Tom Randles (170th), Luke Herbert (171st), Simon Barnes (195th), Paul Loveridge (258th), Merlin Tolley (259th) and Rob Jordan (274th). 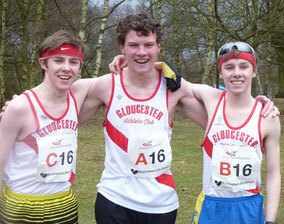 A group of Gloucester Athletic Club’s promising junior athletes competed at the Cheltenham 5km Parkrun on Saturday. Alidia Vaile placed 69th in 23:46, whilst Jude Dowdeswell set a new personal best for the distance of 24:27 in 84th place. Imogen Dowdeswell clocked 32:55 for 195th place in her first parkrun and Gabrielle Vaile finished just behind in 197th in 33:00. At the Newent Parkrun event, junior Briony Bishop placed 6th in 22:40 and Beryl Sampson finished in 66th place in 45:58. A group of Gloucester Athletic Club members, many of whom had competed in the Gloucestershire Cross-Country League fixture at Cheltenham, took part in the Tewkesbury AC Guy Fawkes Five-mile road race on Sunday (3rd). James Head placed 27th in 31:07, Beryl Sampson finished 81st overall and first W55 in 35:01 and Dave Spackman placed 110th overall and 2nd M65 in 36:47. Spackman’s placing gave him 1st place in this year’s County Road Race series for the M65 category. Rob Jordan placed 126th in 37:47 and Denise Evans 130th overall and second L50 in 37:56 to take silver medal in the County Series. Gloucester Athletic Club sent a development squad to contest the second of the season’s Gloucestershire Cross country League fixtures at Pittville Park in Cheltenham on Saturday (2nd). With the senior team’s leading runners preparing for next Saturday’s Birmingham League opener, the Gloucestershire League gives the fringe runners the opportunity to feature in the scoring team. Newcomer John Gormley was the second runner to score, placing 60th, as he continues to establish himself in the City’s senior squad. The next two runners home were established veterans and mainstays of the Club’s endurance group Dave Gresswell and Arthur Daley, placing 82nd and 118th respectively. Daley was 2nd in the M60 category. Behind them, Max Sheppard continued his return to fitness after injury, placing 130th, just ahead of James Head who placed 134th to complete the scoring six. The team placed 13th on the day. Simon Barnes was the first of the reserves to finish, in 188th place, with Russell Kirby (218th), Rob Jordan (222nd), Clive Poole (230th) and Chris O’Carroll (253rd) making up the rest of the squad. Rose-Anne Galligan was heading for a top three finish in a very competitive senior ladies race but suffered a shoe malfunction when clearing the notorious brook on the Pittville course. The spike plate on one of her shoes was damaged, causing her drop out of the race when in a strong position. That left Beryl Sampson to lead the Gloucester ladies home in 51st place and with Sue Higgins (54th) and Nicola Hovey (74th), the City club finished a scoring team for the second time this season. Emma Jeffery (75th) and Trudy Wells (138th) provided good back-up support. Gloucester Athletic Club’s junior athletes showed encouraging early season form at the Gloucestershire Cross-Country League fixture at Pittville Park on Saturday (2nd). In the U15 Girls race, Bethan Moor ran a well-judged race to place 6th, with team-mate Abi Pearce finishing in 17th place. In the U15 Boys race, Will Staddon led the City team home when placing 7th. Harry Wells (24th) and Andrew McPeake (35th) secured 5th place for the team. Briony Bishop took an excellent 6th place in a tight finish in the U13 Girls race and with solid support from Alidia Vaile (16th) and Laura McPeake (17th) the team took 3rd place. Jude Dowdeswell placed 34th and Elissa Moor finished in 52nd place. In the U11 Girls race, the City team of Gabrielle Vaile (40th), Alexandria Nicholls (61st) and Sydney Nicholls (63rd) placed 16th. At the latest Pomphrey Sports 5km Winter Series race in Bristol, Gloucester AC’s Arthur Daley ran his fastest time for two years when placing 38th overall and second M60, in 19:23. Nicola Hovey ran 22:49 for 65th overall and 1st W55, just two days after completing the Stroud Half Marathon. Nathan Smith led a large Gloucester Athletic Club contingent home in this year’s Stroud Half Marathon (27th), placing 39th overall in 81:25. The strong winds and heavy rain did not deter Matt Boon as he crossed the line in 45th place in a new personal best 83:25, whilst James Head produced another consistent run to place 68th in 85:51, his third time inside 86 minutes in two months. Dave Gresswell was next to finish, just behind in 72nd place in a season’s best 86:35, whilst Max Sheppard was delighted with his first run back following injury, placing 156th in 92:42. Hayley Winters led the Gloucester ladies home. Just two weeks after a disappointing run in the Chicago Marathon, she placed 158th in 93:00. Another lady, Denise Evans, was next to finish, 431st in 1:44:56 whilst veteran Dave Spackman placed 442nd overall and first M65 in 1:45:12. Sharron Harris clocked a personal best 1:49:10 in 571st place, Nicola Hovey placed 618th in 1:51:16 and Clive Poole 652nd in 1:52:20. A group of six Gloucester Athletic Club runners travelled to north Wales on Saturday (26th) to tackle the Snowdonia Marathon. The event is widely regarded as one of the most arduous in the UK as it encircles Snowdon, the highest peak in Wales, as well as taking in three notable climbs, the Llanberris Pass (1,100ft), Beddgelert (2,000ft) and the 1,200ft Bwlch y Groes which is the final climb but followed immediately by a very steep downhill stretch. Lee Smith and Jeremy Mower set off at a good pace, staying locked together for the first half of the race before Mower, using his endurance strength gained from ultra-distance running, gradually pulled away from his Gloucester colleague. During the next six miles, Mower caught and overtook four runners before taking another four on the notorious climb between miles 21 and 24. Mower clocked 3:03:10 to finish 24th overall and fourth in the M45 category but second in the Welsh Masters Championships which were being incorporated into the event. Smith remained strong to cross the line in 40th place, clocking 3:08:41. Tom Randles, in his first race back following an Achilles tendon injury, finished 89th of the 1554 finishers in 3:19:47 while Simon Barnes placed 316th in 3:43:3. Ben Gardiner, running his first road marathon placed 467th in 3:53:41 with Phil du Plessis placing 845th in 4:29:54. Gloucester Athletic Club’s Simon Fortnam won the Weymouth 5km Parkrun event on Saturday (26th) in 17:54 whilst closer to home, at the Cheltenham event, youngsters Briony Bishop and Alidia Vaile placed 56th and 69th respectively. 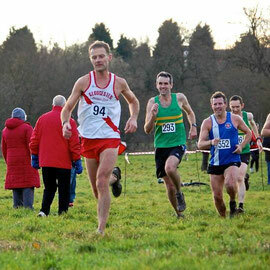 At the Severn AC-organised Chocolate Biscuit Cross-country event at Plock court on Saturday (26th), Gloucester Athletic Club’s Rob Jordan placed 5th of the 9 finishers in 29:58. In the annual Poppy Plod, organised by the RBL Hardwicke, Gloucester Athletic Club’s Sue Higgins placed 3rd overall and 1st lady in 18:11, with Andrew McPeake 5th (1st U15) in 20:42. In the Bupa Great Birmingham Half Marathon on Sunday 20th, John Gormley of Gloucester Athletic Club placed 218th in 86:06. Parkrun 5kms events have grown in popularity since their inception in London some 10 years ago and now, many towns and cities across the UK stage these weekly, free-to-enter runs that are open to people of all abilities, from the first-timer up to Olympian. 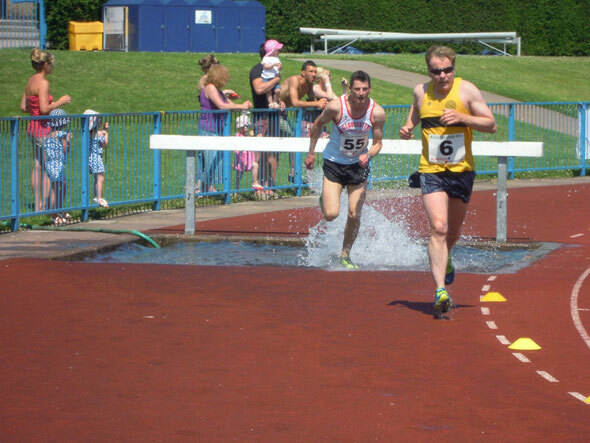 Gloucester Athletic Club members took part in two such events on Saturday (19th). 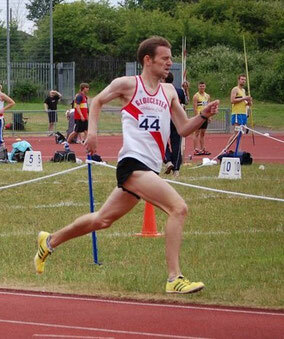 At the Cheltenham run in Pittville, Dave Greswell led home the Club’s contingent when placing 10th in 18:56. Junior lady Alidia Vaile was just outside her personal best time for 5km, placing 68th overall and 6th lady in 23:13, whilst Russell Kirby continued his return to racing placed 72nd in 23:25. Another junior, Victoria Kirby placed 130th in 26:21 and youngster Gabrielle Vaile placed 184th of the 225 finishers in 31:10, her first attempt at the distance. At the Newent Parkrun, junior lady Briony Bishop continued her run of good form at this event, placing 10th in 23:22, just ahead of Rob Jordan who finished 13th in 23:46. Beryl Sampson placed 33rd in 28:15. Gloucester Athletic Club have appointed Steve Millward (pictured below) as their Midland League track & field team manager for the 2014 summer season, replacing Richard Blackwell who has stepped down after three seasons in the role. 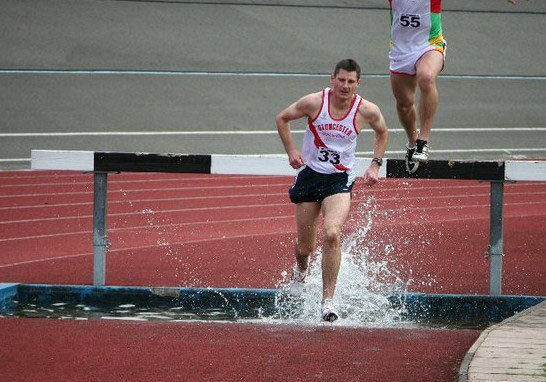 Millward, a former Midland 3000m steeplechase champion, has been the club’s leading male points scorer in the league for the past three seasons, competing in as many as five events in a match. Gloucester Athletic Club’s Nathan Smith and Hayley Winters travelled across the Atlantic to compete in the Chicago Marathon on Sunday (13th). Smith finished in 3:03:45 and Winters, suffering from stomach cramps throughout, ran 3:56:19. The race winner, Kenya’s Dennis Kimetto, crossed the line in 2:03:45, just 22 seconds down on compatriot Wilson Kipsang’s recently-set world record. At the Bugatti 10km race in Cheltenham on Sunday (13th), Gloucester AC’s Dave Spackman finished 66th overall and 3rd in the M60 category in 47:35, just ahead of club mate Denise Evans, who placed 67th overall and 2nd in the W50 category in 47:42. At the Cheltenham 5km Park Run on Saturday, juniors Alidia Vaile, Jude Dowdeswell and Victoria Kirby all recorded new personal bests as did another youngster, Briony Bishop, at the Newent Park Run. Russell Kirby and Rob Jordan set new personal bests at the Cheltenham and Westonbirt events respectively and Beryl Sampson competed at the Newent race. Anna Robertson, Gloucester Athletic Club’s leading female thrower this year, has been recognised for her cricket-coaching skills. 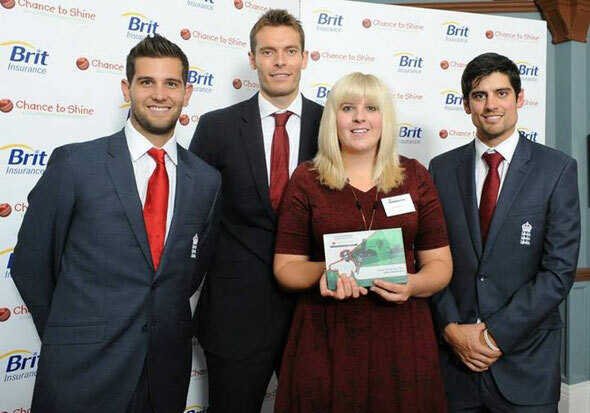 Anna won the Chance to Shine Coach of the Year Award for 2013 at the Brit Insurance Annual Achievement Awards ceremony held on 10th October at the Oval ground in London for her outstanding services to cricket development in schools in Herefordshire. 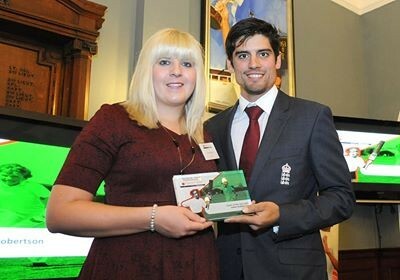 Our pictures show Anna receiving her award from England players Jade Dernbach (l), Chris Tremlett (2nd left) and captain Alistair Cook (r), with Alistair Cook, and in shot putt action for Gloucester AC. The Gloucester 24-hour track race has been confirmed for the weekend of Sat/Sun 14/15th June 2014. The event shall take place at the Blackbridge Jubilee Athletics Track, the same location where in 1982 Gloucester AC’s Dave Dowdle set a then world record of 274.480km (approximately 170.5 miles) a distance which is still the British record. Two Gloucester Athletic Club members competed in the Cardiff Half Marathon on Sunday (6th). Mike Mansfield placed 158th overall in 1:20:09 and Kerry Newell finished in 1912th place in 1:42:20. Former member and club U17 and U20 hammer throw record holder Kate Yhnell also ran, finishing in a time of 2:37:50. Yhnell's performance was all the more impressive as she was running with cracked ribs sustained in a recent accident. She had recorded a pb of 2:26:09 in the Bristol Half Marathon on 15th September. 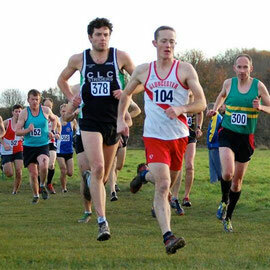 Gloucester Athletic Club’s Martin Hobson placed 66th in Sunday’s Cricklade 10km in 47:41. Gloucester Athletic Club members travelled to Guiting Power on Saturday (5th) to compete in the opening Gloucestershire Cross-Country League fixture of the new winter season. The course, around the Cotswold Farm Park, has become the traditional setting for the season’s opener and Saturday’s competitors faced unseasonably warm and sunny weather, with temperatures in the high teens. The senior men’s race saw the City club field a developmental squad, including two brand new signings John Gormley and Clive Poole and Russell Kirby who was making his first cross-country appearance for many years, with all three runners acquitting themselves well. The team was led home by Simon Fortnam in 38th place, giving further evidence that he has overcome the injury problems that beset him last winter and that he should be a regular scoring member of the senior team in the more challenging Birmingham Cross-Country League matches that lie ahead. Second man home for Gloucester was Dave Gresswell, in 68th position, who defied doctor’s orders to run, despite still suffering the effects of concussion. Gresswell was followed home by Gormley in 81st place, who had only signed up for the Club in the week leading up to the race. Fourth and fifth scorers, Matt Powell and Arthur Daley were in close proximity throughout the 9.5km race with Powell coming home in 102nd place and Daley 105th and 1st M60. Russel Kirby was the sixth scorer to finish, in 181st, and Clive Poole brought the team home in 211th place. The team placed 13th overall, a satisfactory result given they were far from being at full-strength. The Club’s senior ladies finished a full team for the first time in a couple of seasons, demonstrating the Club’s desire to field more ladies in these events. Beryl Sampson was the first City lady to finish, in 36th place, just ahead of Sue Higgins, in 39th position. Nicola Hovey completed the scoring team in 64th place with Emma Jeffery (69th) and Trudy Wells (116th) being the remaining club runners. There were plenty of Gloucester Athletic Club vests on show in the junior races at the Gloucestershire Cross-Country League fixture at Guiting Power on Saturday (5th). In the U15 boys race, Will Staddon made an encouraging start to his winter campaign when placing 7th with training colleague Harry Wells finished in 24th place. In the U15 girls race, Bethan Moor finished in 7th place and Abi Pearce in 14th. Cressida May led the City team home in the U13 girls race, placing 12th, with Alidia Vaile (24th) and Elissa Moor (32nd) completing the scoring team, Jude Dowdeswell placed 46th as the team finished in 6th place. In the U11 girls race, Gabrielle Vaile placed 35th and Lucy Jeffery 40th. Junior endurance coach, Kerry Newell, said afterwards “I’m really pleased with the turn-out by our youngsters today. They all put in 100% effort and I can’t ask for any more than that. Gloucester Athletic Club’s Anna Robertson struck gold at the Wrexham Final Fling open throws meeting on Sunday (29th) to bring the curtain down on her most consistent-ever season. She won the hammer throw with 45.41 metres, the shot putt with 9.99 metres and discus with 28.21 metres. Robertson, who was the Club’s leading female points scorer in the 2013 Midland League campaign, will now be taking a short rest before embarking on her winter training programme. Denise Evans of Gloucester AC placed 1115th in Sunday’s Berlin Marathon in 3:44:31. Gloucester Athletic Club’s Jeremy Mower was the first finisher of 50 runners that took part in the Cotswold Challenge Marathon on Saturday (28th). The multi-terrain course takes in just under 27 miles of the Cotswold Way, starting at Birdlip and taking in various villages in a loop before finishing back in Birdlip. Mower’s time was 3 hours 52 minutes 18 seconds which was satisfactory, given that he suffered a nasty fall during the race, resulting in sore ribs, an injury that he hopes to overcome ahead of the Snowdonia Marathon at the end of October. Mike Mansfield placed 2nd at the Newent Parkrun on Saturday (28th) in 19:44 whilst Briony Bishop (U13) placed 7th in 22:40. The Irish national 800 metres record-holder and Gloucester AC member, Rose-Anne Galligan, was the special guest of honour at the Club’s annual Awards Night last Friday (27th). Galligan ran 2:00.58 at the Anniversary Games in London in July, breaking Sonia O’Sullivan’s record that had stood for 19 years. Now back into her training following a short break after her appearance at the World Athletics Championships, Galligan’s focus over the winter months shall be aiming to qualify for the Ireland team for the World Indoors Championships in Poland in March. Compere for the evening, Garry Hunter, told the assembled audience that 2013 had been one of the most successful in the Club’s history with many regional honours being won and no fewer than 32 new Club records being set during the year. The Club also had a record number of new members making their competitive debuts during the summer. Terry Sysum Memorial Award for high level competition - Alex George. Gloucester Athletic Club’s U17/U20 team has won promotion to Midlands Area West One in the National Youth Development League after being involved in a “paper match” against Halesowen. Both teams finished level on points after the regular season and their best performances over three of the four matches were then taken into account. 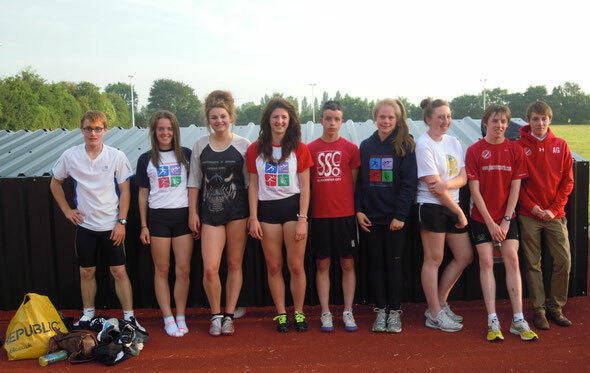 Gloucester Athletic Club multi-eventer Kate Davies achieved a new personal best when placing 6th in the English Schools Heptathlon Championship at Birmingham over the weekend (21st/22nd). Davies recorded a total of 4254 points, an improvement of 97 points on her previous best set earlier this season. The Gloucester athlete, who turns 18 this week, opened her competition in the best possible manner, setting a new personal best time of 16.90 seconds for the 100m hurdles leaving her in 14th place in the standings. She then cleared 1.55m in the high jump and then recorded 8.84m in the shot putt. A time of 27.34 seconds for the 200 metres left her in 10th place overall at the end of day one. Day two opened with a very solid 4.96m long jump, followed by a new personal best and Gloucester club record 37.09m in the javelin which propelled her up to 7th place. Davies then ran a season’s best 2:31.87 for the 800 metres, leaving her in 6th position overall. Davies was very pleased with the result, considering the regular season had died down several weeks ago. She’ll now take a break before embarking on her winter training preparations for next season. 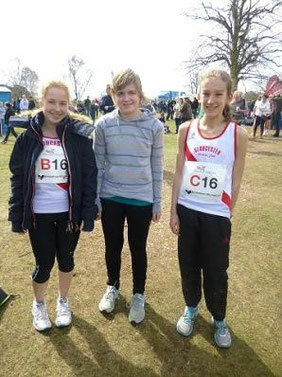 With many of their leading distance runners taking a well-earned rest following a long, arduous track racing season it was a weakened Gloucester Athletic Club team that competed in the Midland Six-Stage Road Relay at Sutton Park in Birmingham on Saturday (21st). Alidia Vaile recorded 23:30 to finish first in the U13 Girls category. 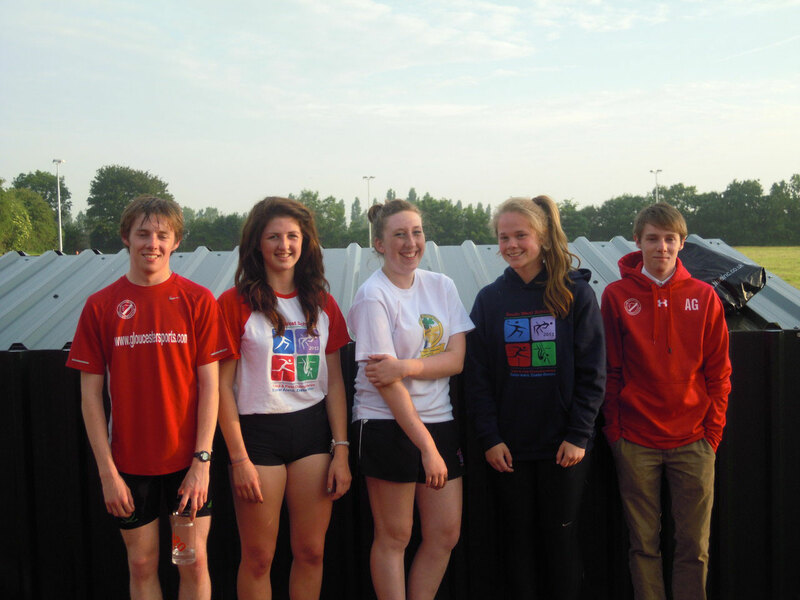 Gloucester Athletic Club members were taking part in Half Marathon events around the region over the weekend (14/15th). Lee Smith led the city contingent home in the Chippenham Half Marathon, placing 18th in 1:20:38. Behind him, Matt Boon recorded 1:23:58 in 34th place, Matt Powell set a new personal best when finishing 39th in 1:24:33 with Max Sheppard completing the team in 159th place with 1:34:24. Closer to home in the Cheltenham Half Marathon, Nathan Smith took over two minutes off his personal best when placing 18th in 1:18:30. Hayley Winters won the Senior Ladies category, recording 1:29:27 and newcomer Sue Higgins knocked five minutes off her best, clocking 1:34:46 for second place in the F50 category. 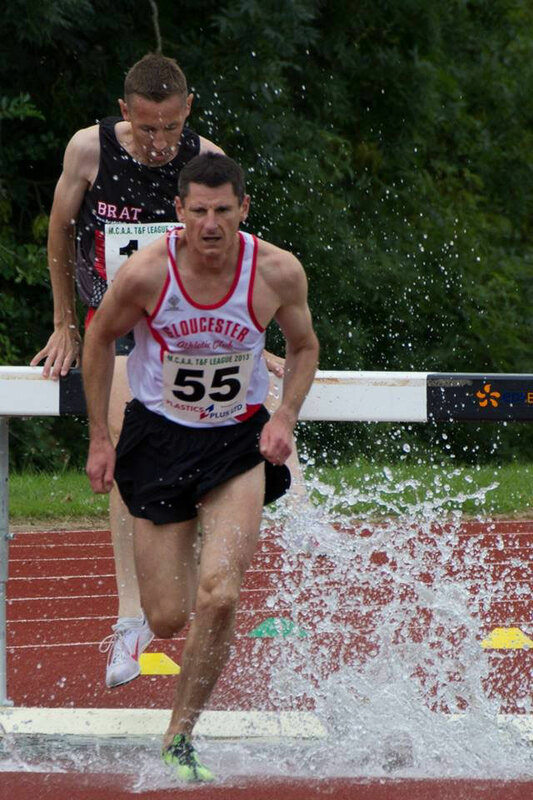 Gloucester Athletic Club members were among the medal-winners at the 2013 British Masters Athletics Championships in Birmingham at the weekend (14/15th). Simon Fortnam took pride of place, winning the gold medal in the M40 3000 metres steeplechase in a season’s best time of 10:47.24. Paul Barlow took the silver medal in the M40 1500 metres in 4:27.15 before being edged out of the medals in the 5000 metres, finishing fourth in a season’s best 16:20.56. Marion Loveridge was the Club’s third athlete to stand on the podium when she took the silver medal in the W50 hammer throw. Her best throw, 40.39 for the 3kg implement, was 49cm behind gold. For good measure, she also threw 7.90m in the W50 3kg shot putt for 10th place. 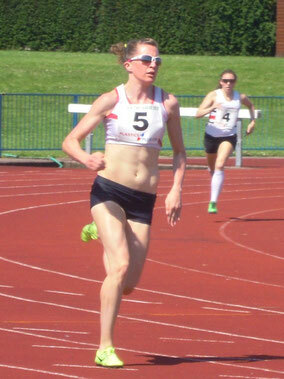 Christine Campbell ran 17.04 seconds in the W40 100 metres and 36.10 in the 200 metres. Gloucester Athletic Club’s Dayna Willoughby represented the South West England team at the Sainsbury’s Schools Games match in Sheffield at the weekend (14/15th). Though hampered by a calf strain and the difficult weather conditions, Willoughby placed 7th in the 300 metres in 41.86 seconds and was a member of the team that placed 5th in the 4 x 300 metres relay event. Gloucester Athletic Club brought the curtain down on a successful 2013 track & field season when it sent a large team down to compete in its final team fixture of the year, the Avon League match at Yate on Sunday. 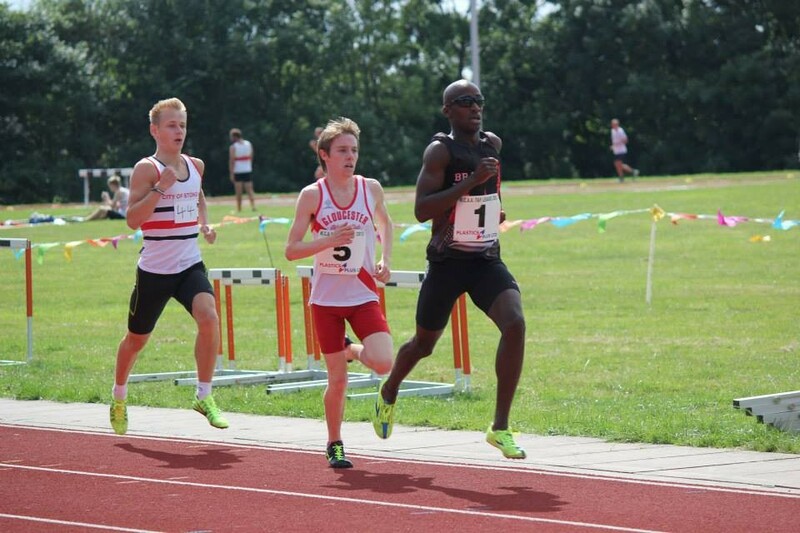 The club has been using this League as an opportunity to introduce many of its newcomers to track & field competition and this was again evident on Sunday, as many athletes made their Gloucester AC debuts. However, it was the performances of more established members who stole the show and finished their seasons on high notes. 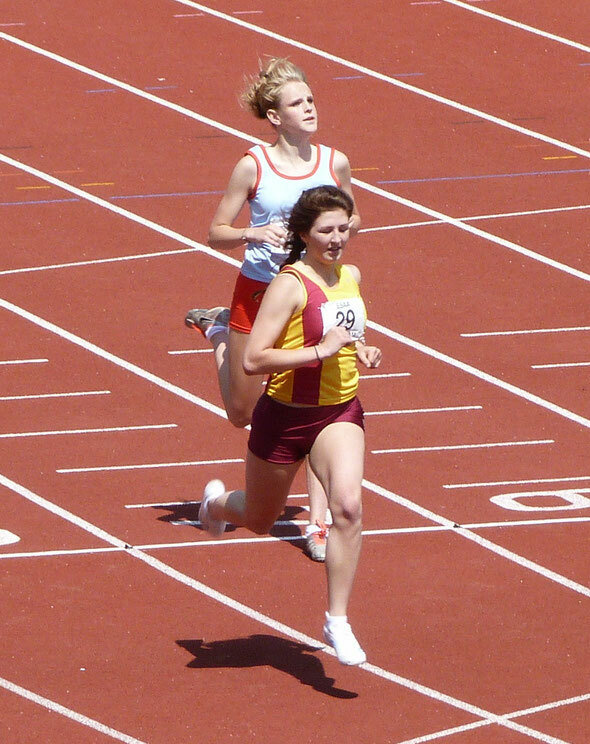 Sophie Lambert was the club’s top sprinter during the 2000s, establishing herself as one of the fastest sprinters over 60 and 100 metres in the region before moving away to concentrate on her studies. Now a qualified doctor, Lambert has returned to the Gloucester club this year and become a cornerstone of the sprint group led by Garry Hunter and Richard Blackwell, passing her experience and advice onto younger athletes in the group whilst gradually regaining fitness and form. She showed glimpses of days gone by at Yate, sprinting to convincing wins in the 100 metres and 200 metres in 12.7 and 26.5 seconds respectively, her fastest times in over three seasons. Another athlete to shine was U20 Tom Beckett, who set new personal bests in the triple jump (11.56m) and high jump (1.60m). Beckett has worked well with Jo Willoughby’s jumps group at the Blackbridge track during the summer and has shown great improvement in recent weeks. 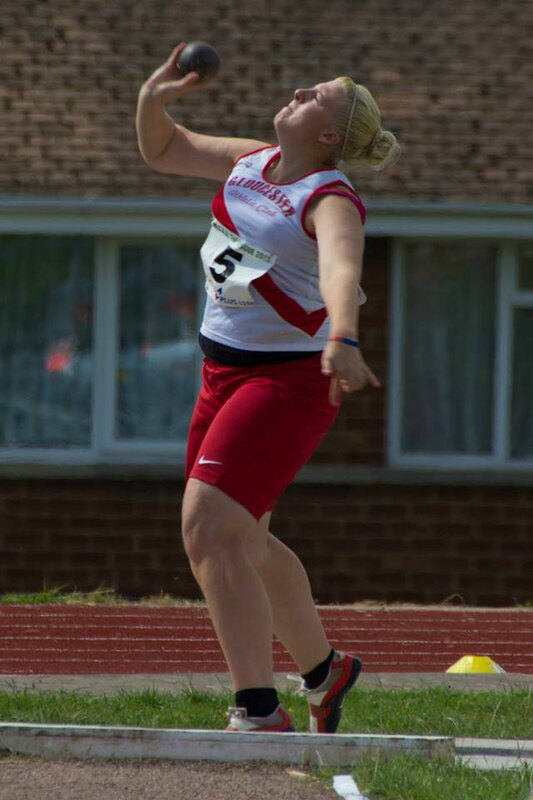 Gloucester Athletic Club’s Marion Loveridge was in top form at the Tipton Games on Sunday, setting a new personal best 42.59 metres for the 3kg hammer throw. This bettered her previous best by three metres. Gloucester Athletic Club have released details of their winter training programmes. Indoor circuit training sessions shall start on Tuesday 1st October at the Crypt School Sports Hall. There will be two sessions, the 7-10 year olds session shall run from 6-7pm, with the 11 and older strength & conditioning sessions running from 7-9pm. On Thursday evenings, the Club shall be training from 6:30-8pm and on Sunday mornings, from 10:30-12:30am, on the Blackbridge track. More details can be obtained by ringing 07817 974630, or by checking the Club’s website – www.gloucesterac.co.uk. The endurance running sessions are unchanged, training commencing at 7.00pm on Tuesday and Thursday evenings at Blackbridge. Many of Gloucester Athletic Club’s young athletes were in the mood to revise their personal bests when they competed in the Sprints & Hurdles Fest at Yate on Sunday (1st). This meeting has established itself as one of the last competitions of the season in recent years, allowing many athletes one last opportunity to compete before they say goodbye to the summer season and head into their arduous winter training programmes. One of the Club’s unsung performers in 2013 has been 400 metres runner Andrew Bowers and he has made steady progress since moving to Paul Pepler’s training group at the Blackbridge track. The U20 athlete has been the Club’s most consistent athlete over one lap this season and he made a significant breakthrough on Sunday, dipping under 53 seconds for the first time as he lowered his personal best time to 52.74 seconds. Another athlete to improve was sprinter Nasdeep Purewal. A newcomer to the sport this season, he has steadily reduced his personal best times over the shorter sprint distances to establish himself in the Gloucester club’s promising sprint squad. 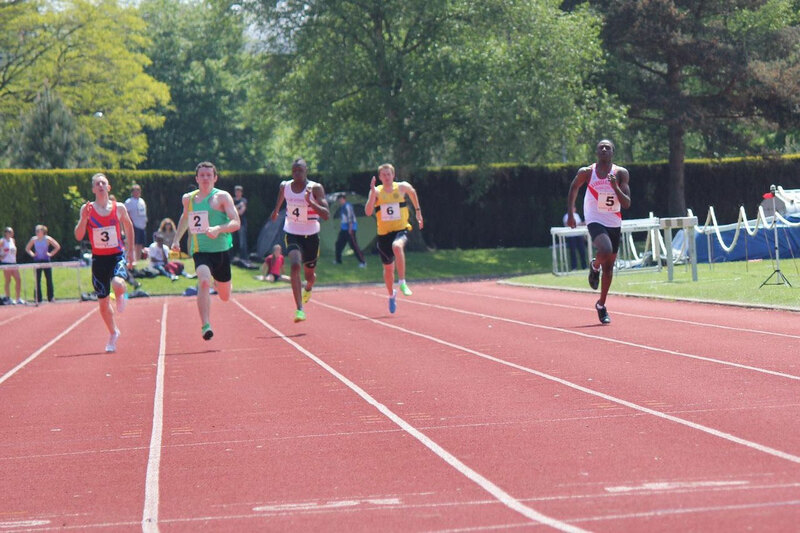 At Yate he lowered his times further to 11.69 and 23.64 seconds for the 100m and 200m respectively. 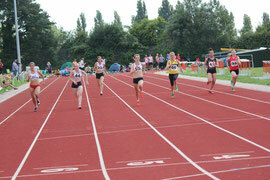 Sprinter Catherine Hardy was also in top form, lowering her personal best for the 200 metres to 26.08 seconds. Both are members of the sprint group led by Garry Hunter and Richard Blackwell. Heptathlete Kate Davies showed that she is benefitting from the work she has been doing with hurdles coach Ian Willoughby and also maintaining her form ahead of the English Schools multi-event championships later this month, by setting a new personal best over 100m hurdles, recording 17.45 seconds. Matt Powell 3rd in 19:52; Rob Jordan 12th in 23:09; Briony Bishop 13th in 23:23. 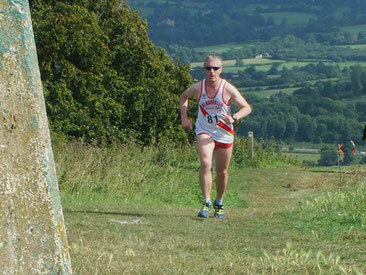 Dave Gresswell was Gloucester Athletic Club’s top performer in the annual Robinswood Fell Race, placing 5th. 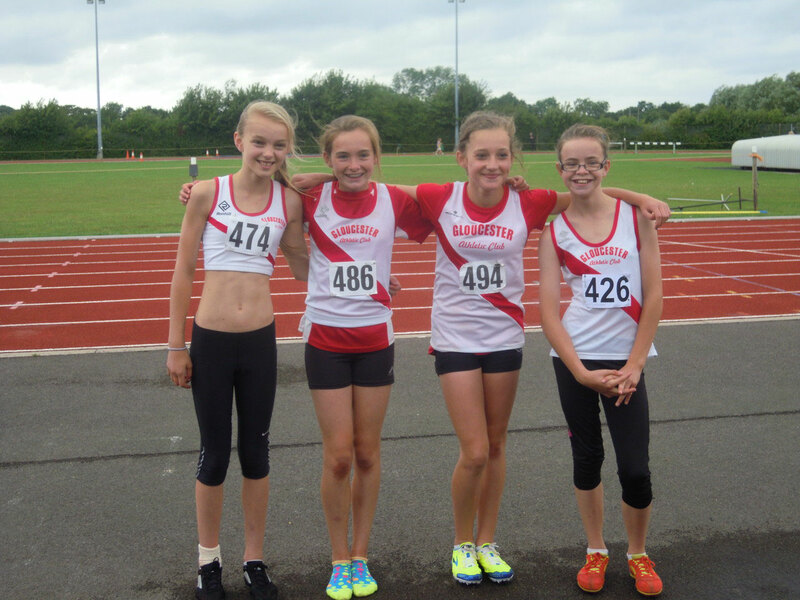 Gloucester Athletic Club members were in action at the Cheltenham Young Athletes Open Meeting at the Prince of Wales Stadium on Bank Holiday Monday (26th). In the U15 Girls 800 metres, Bethan Moor judged the pace and opposition perfectly to come home the victor in 2:32.9. Moor’s training partner Alidia Vaile was another winner, taking gold in the U13 Girls 75 metres in 11.4 seconds and the 200 metres in a personal best-equalling 29.7 seconds. Vaile also placed 3rd in the U13 Girls 800 metres and then joined forces with Grace Pitman, Amelia Hill and Jada George to win the 4x100m relay. In the field events, there were wins for Jada George in the U11 girls ball throw and for newcomer Ben Wade in the U13 Boys discus. At the Birchfield Open Meeting on Sunday (25th), Christine Campbell placed 6th in the ladies 100m in 16.71 seconds and 4th in the 200m in 35.12 seconds, a personal best. Another thrower to show good end-of-season form was Anna Robertson at the City of Stoke Open Meeting on Sunday (25th). She took first place in both the hammer and shot putt competitions, throwing 43.78m and 9.75m respectively, before setting a new personal best 28.29m for second place in the discus. Gloucester Athletic Club’s Gareth Winter placed 3rd in the shot putt at the International Athletics Gala in Antwerp, Belgium on Saturday (24th) with a best putt of 16.04m. He was pleased with this effort as the circle was extermely slippery and most athletes were some 1 metre down on their normal performances. Nathan Smith of Gloucester AC placed 3rd in the Thames Meander Marathon in Kingston-on-Thames on Saturday (24th) in a new personal best time of 2:53.55. Hayley Winters was second lady and 19th overall in 3:18.46, also a personal best. In the supporting half Marathon, Denise Evans placed 56th overall and 1st W45 in 1:52:58. Gloucester Athletic Club were in dominant form at the County Relays Championships at the Blackbridge Jubilee Athletics Track last week (21st). In the U13s 4x100m events, the boys team of Lewis Drewett, Joe Langbridge, Sam Earl and Lewis Nicholls struck gold whilst in the girls’ race, the City club fielded two teams. The ‘A’ squad of Amelia Hill, Saskia Barnett, Jude Dowdeswell and Alidia Vaile won the gold medal with the second-string team of Ellie Emerson, Stephanie Fox, Annabelle Richardson and Gabrielle Adams taking the silver medal. There was another double celebration in the U17s 4x100m events as the ladies team of Adela Hill, Siobhan Barnes, Imogen Maguire and Catherine Hardy and U17s men’s team of Ben Potts, Julian Richardson, Luke Hill and Jevaughn Gayle both took convincing victories. The hastily-assembled Senior Men’s 4x100m team of Nas Purewal, Tom Beckett, Andrew Bowers and Ian Willoughby won the silver medal. There were three further successes in the 4x400m races. The Gloucester U20 Men’s team of Andrew Bowers, Tom Beckett, Ben Potts and Julian Richardson were untroubled as they took the gold medal whilst there were gold medals for the U13 Girls team (Saskia Barnett, Jude Dowdeswell, Amelia Hill and Alidia Vaile) and U13 Boys team (Lewis Drewett, Joe Langbridge, Sam Earl and Lewis Nicolls). Both the U13 relay times were new club records. The meeting also incorporated the County 10,000 metres track championships. Peter Woodward of Bristol & West AC was a convincing winner, with Gloucester’s Mike Mansfield placing 4th overall and 1st M40 in 37:04.5 and Beryl Sampson finishing 14th overall and first LV55 in 45:36.4 - the first time in the club's history that a female has completed the 10000m event on the track..
Jubilee Mile, race two: 7th Arthur Daley 6:02.5; 11th Beryl Sampson 6:20.9 (club F55 record); 17th Dave Spackman 7:04.5. Jubilee Mile, race four: 5th Alidia Vaile 6:08.3. Open Mile: 10th Mike Anderton 7:44.8. Several Gloucester Athletic Club members recorded new personal bests at the August White Horse 5km road race in Sandhurst. Nathan Smith, in his last race before the Thames Meander Marathon, equalled his personal best 16:43 in 17th place. Dave Gresswell continued his return to form, placing 36th in 17:56, just ahead of Matt Powell whose 18:06 in 38th place was a personal best. Hayley Winters placed 47th in 18:40 which was just two seconds off her personal best, whilst Arthur Daley finished 59th in 19:26, an improvement of 34 seconds on his last 5km three weeks previously. As this race incorporated the County 5km road race championships, Daley took the M60 title. Rob Jordan placed 79th in 21:52 and Dave Spackman 82nd in 22:27, placing 2nd M60 in the County championship. The race was notable for the performance by Martin Rees of Cardiff-based Les Croupiers, his 16:08 claiming to be a new World age-group best time. At the Midland Counties Championships in Birmingham (17/18th), sprinter Kelly Constable continued her run of good form, winning the U17 Ladies 100 metres in 12.82 seconds. She then took the silver medal in the 200 metres in a new personal best 25.39 seconds. Dayna Willoughby was another medal winner at the Midlands event, taking the silver medal in the U17 Ladies 300 metres in 40.73 seconds. Earlier, she had placed 4th in the 200 metres final in 25.59 seconds. Ellen Thrall won gold in the U17 hammer with 36.60m. Lange followed his winning performance at the recent South West Championships with another medal, this time at the British Athletics Jumps and Throws Fest at Bedford (17th), where he won the bronze medal in the U20 Men’s hammer with 55.84m. Strong winds and heavy rain put paid to any chance of revised personal bests at the BMC Grand Prix Final in Stretford on Saturday (17th) for Gloucester Athletic Club’s leading male middle distance runners. Alex George returned to the scene of his fastest-ever runs over 1500 and 3000 metres to contest the shorter distance, placing 8th in the ‘C’ race in 3:54.78 whilst training partner Richard de-Camps placed 6th in the ‘E’ race in 3:57.66. Gloucester Athletic Club's Jeremy Mower took third place at the British Ultrafest 24 hour track race at Radley College, Abingdon. He covered 184.827km (114.8 miles) for a new track personal best and break the club's over 45 age group record. His distance was some way off his road PB of 208km but it was a good distance with hot and humid conditions during the day, plus he had stomach issues in the early part of the race which nearly forced him to quit after he'd run marathon distance. The high humidity ment Mower had to change top and socks five hours into the race as they were soaking wet. Mower's rough patch lasted several hours and he was lying in 9th place at one stage. Mower said "I thought of quitting several times but at the back of my mind I told myself just to hang in there and see what happens as in 24 hour races things can change suddenly". After 9 hours of running the temperature cooled during the night and with the stomach issues gone he was able to move up to 3rd place after 18 hours of running. During that time the other athletes paid the price for pushing the pace too hard early on under the weather conditions, whilst Mower's fresher legs enabled him to push on through the night. Three international ultra runners dropped out of the race and one of the race favourites ended up in hospital with dehydration showing how tough the race conditions were. One of the other competitors said it was like running in a sauna. Mower backed off a bit when in third as he could not catch those ahead but finished the last 30 mins strong including a sprint final lap for the spectators which had them cheering. Italian international Antonio Tallarita won the race with 204.9km. Mower received plenty of encouragement from the sidelines which included Gloucester ultra legend Ken Leyshon and his brother Greg. Mower was very pleased with his run as his normal monthly training mileage for a 24 hour race would be 300 and he has only been able to manage 150 the last few months. At the South-West Championships in Exeter (11th), Catherine Hardy took the gold medal in the U17 Ladies 100 metres final in 12.69 seconds, whilst club-mate Jacob Lange won the U20 men’s hammer with a throw of 56.73m. Ellen Thrall claimed two bronzes, in the U17 ladies hammer with 37.75m and the U17 ladies discus with 23.99m. Gloucester Athletic Club’s senior team showed perfect timing as they romped to victory in the final Midland Athletics League Division Two fixture of the season at the new Blackbridge Jubilee Athletics Track on Saturday. The Podsmead track underwent a much-publicised massive redevelopment 12 months ago and Saturday’s fixture was the first full-scale match of its kind, including every athletic event for men and women, ever to take place in the City and the home Club’s athletes responded to the party atmosphere and the perfect conditions in the best possible manner. From the moment that Tim Williams set a new Gloucester club record 61.34 metres to win the very first event, the men’s hammer throw, you could sense that there was something special in the air. Williams’ team-mates followed his example, setting new personal and season’s best performances as well as two new senior Club records during the afternoon. In the men’s events, there was total dominance in the middle distance events as Richard de-Camps and Alex George recorded double victories, with excellent support from Ryan Hearn and captain Steve Millward who had another busy day, the highlight of which was victory in a thrilling steeplechase. There was a much-improved showing in the ladies middle distance events too, as Beth Wells, Kathryn Purcell, Emma Jeffery and Beryl Sampson all earned valuable points. The men’s and ladies throwers also dominated. Justin Sysum recorded three wins in the men’s ‘A’ string javelin and ‘B’ string hammer and discus events, whilst Anna Robertson, Lauren Richards and Charlotte Stallard also produced their best all-round performances of the season. The highlight in the ladies events, however, belonged to Kate Davies who improved her personal best no fewer than three times to win the javelin competition with a new senior Club record for the current specification of 36.43 metres. Davies then joined forces with Katharine Chadwick to record a double victory in the high jump ‘A’ and ‘B’ strings, before forming part of the ladies 4 x 400m relay which set a season’s best when finishing second behind a very strong Stoke squad. The third senior club record of the day came in the ladies 4 x 100m relay as the City sprint quartet of Sophie Lambert, Dayna Willoughby, Kelly Constable and Catherine Hardy broke the tape in 49.0 seconds, an improvement on their previous record by eight-tenths of a second. Gloucester/Severn 398.5 pts; City of Stoke 376; BRATs 342; Bristol & West/Yate 312; Bromsgrove & Redditch 285.5; Stratford-on-Avon 249. BRAT 20 pts; City of Stoke 19; Gloucester/Severn 17; Bristol & West/Yate 15; Bromgrove & Redditch 8: Stratford on Avon 5. 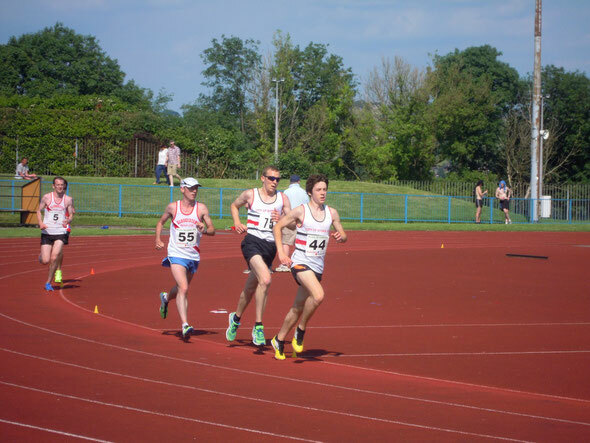 Gloucester Athletic Club’s Alex George travelled up to Stretford to compete in the 3000 metres at the Trafford AC Open Meeting and BMC Gold Standard event last Tuesday (6th) and produced another superlative performance. On the track where he set a 1500 metres personal best in June, he stopped the clock at 8:18.90 seconds to lower his previous best by almost 15 seconds and beating Basyl Martyniuk’s long-standing Club U20 record, set in 1977. The performance propelled George to 3rd in the U20 age group for the season and 6th in Europe and is all the more remarkable given that the Abbeymead youngster still has another two seasons in this age group. George went into the race aiming for a sub-8:30 clocking and for six of the seven and a half laps race was on target for a time of around 8:27 but with 600 metres remaining, he lit the “afterburners”, leaving several more seasoned runners in his wake. Kelly Constable and Alidia Vaile were Gloucester AC’s stand-out performers at the Avon League match at Yate on Sunday (4th). Constable took her good form of the previous week into the match and recorded a convincing sprint treble, winning the U17 ladies 300m, 200m and 100m – the latter in a new personal best 12.4 seconds. Vaile placed second in the U13 girls 1500 metres in 5:28.7 seconds, an improvement of over 30 seconds on her previous best. She followed this up with another personal best, this time in the 200 metres where she clocked 29.7 seconds. Gloucester Athletic Club members were in record-breaking form at the final Midsummer Open Meeting at Cheltenham last week (31st). 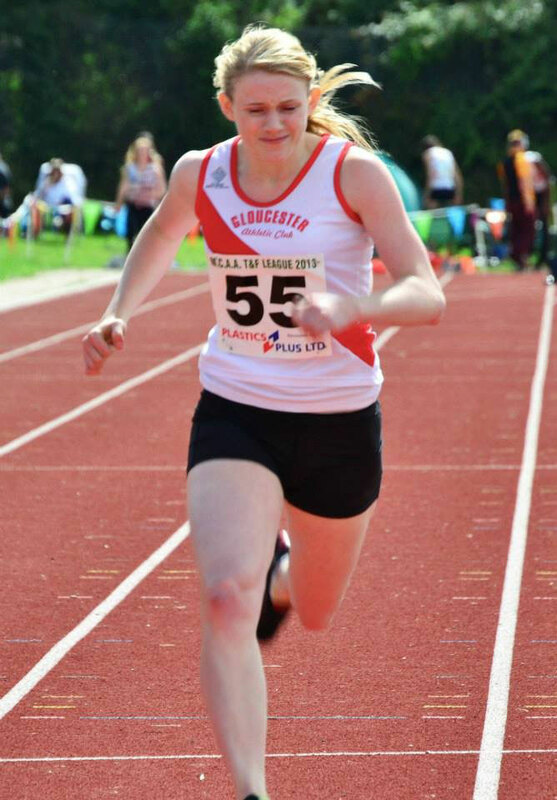 Leading the way was sprinter Kelly Constable, whose 18.5 seconds clocking for the 150 metres was not only a Gloucester club U17 ladies record also the fastest-ever clocking over this rarely run distance by a City lady. She later backed this performance up with a personal best 42.3 seconds in the 300 metres. Ben Potts also set a new U17 men’s record for the 150 metres, recording 17.8 seconds in his heat, whilst youngster Lewis Drewett set a new U13 boys age group record of 21.7 seconds. Club Chairman, Andy McKenzie, set two new Club M50 age group records, in the hammer throw with 22.82m and javelin, 10.05m, both performances badly hampered by a bad back. There were several more personal bests for the City athletes at the meeting. Nas Purewal won his heat of the senior men’s 150 metres in 17.7 seconds and Alidia Vaile continued her recent run of good form when setting a new best of 22.0 seconds in the U13 girls 150 metres. Vaile also set a new personal best in the 1200 metres, clocking 4:18.1. In the field events, Gloucester athletes dominated the hammer events. Rob Wallace and Jacob Lange placed 1st and 2nd in the U20 men’s event whilst there were age group wins for Charlotte Stallard, Ellen Thrall and Marion Loveridge. Rose-Anne Galligan has spoken of her delight after being confirmed in the 11-strong Ireland team for the World Championships in Moscow. The Gloucester AC runner was selected for the 800m after her superb run in the Sainsbury's Anniversary Games in London, when she set a personal best and Irish record time of two minutes, 0.58 seconds to break Sonia O'Sullivan's 19-year-old mark by 0.11 seconds. "It is great news and it has been a brilliant weekend," said Galligan, as she prepared to fly back from Dublin to her home in Cheltenham. "Racing the World Championships in Moscow was always the goal for the season and breaking the Irish record was just a bonus." It will be Galligan's first appearance in the World Championships and will easily be the biggest challenge of her career so far. It is also a notable milestone in her relationship with long-time coach David Farrow. "Apparently I am the first athlete who David has coached to reach the World Championships (at senior level) so that is really nice," added Galligan. "He knows what works for me and has put in a lot of time and effort into devising a training programme for me to allow me the chance to get the best out of myself and the progress I have made this year shows it is working." After Friday evening's race Galligan caught an early-morning train from London to Liverpool to catch a flight over to Dublin for the heats of the 400m in the Irish Championships. She made the final and finished fifth in a season's best time of 55.48, which was 0.11 seconds outside her 2010 PB. But it is over the two laps that Galligan has made a real stir and will be looking to make an impression in the Russian capital. Gloucester Athletic Club’s U20/U17s team completed a hugely successful weekend for the City club by winning the final round of the season’s National Youth Development League in Newport, Gwent to win the West Division 2B. Gloucester Athletic Club’s Catherine Hardy had a special task to perform at the Anniversary Games at the Olympic Stadium on Saturday. The 15 year-old sprinter was a member of the Gloucester AC party that were receiving the VIP treatment, having been filmed for the BBC National Lottery programme that evening earlier in the day. 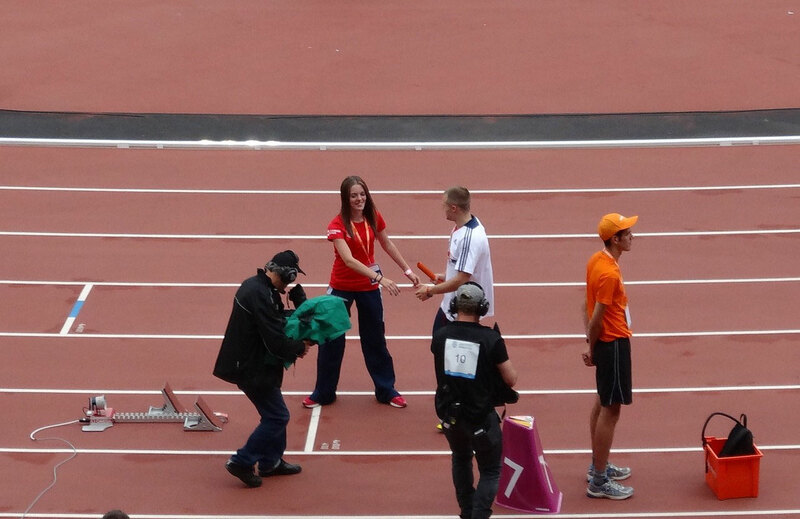 Hardy had been randomly chosen from the group to hand over the baton to the Great Britain squad just ahead of the start of the men’s 4 x 100m relay event. Ironically, that was probably the safest hand-over that the GB team made, as they failed to finish the race – having dropped the baton. Gloucester Athletic Club’s Rose-Anne Galligan chose the biggest occasion of her career to produce her biggest-ever performance at the Olympic Stadium on Friday (26th). Running in the women’s 800 metres in the Anniversary Games, incorporating the Diamond League, the Gloucester AC star lowered her personal best time over two laps to 2:00.58, breaking Sonia O’Sullivan’s Irish record that had stood for exactly nineteen years by one-tenth of a second. Choosing to stay off the frenetic pace, Galligan ran an even-paced race, passing through half-way in around 59 seconds, before moving through the all-international field to place 6th just behind Britain’s Marilyn Okoro. Rose-Anne Galligan is celebrating a record-breaking run at the Diamond League Anniversary Games at the Olympic Stadium in London. 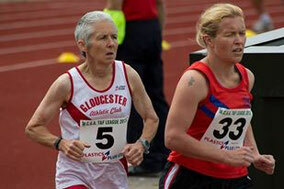 The Gloucester AC star smashed the Irish women's 800 metres record held by Sonia O'Sullivan for the past 19 years. She broke O'Sullivan's time by 0.11 seconds as she clocked two minutes, 0.58 seconds to finish sixth in a race won by the United States' Brenda Martinez in 1.58.19. Galligan, who lives in Cheltenham, said she had a feeling she had run close to O'Sulivan's time but she wasn't aware of how fast she had actually run. "I didn't actually see the time," said Galligan, who beat her personal best by nearly half a second. "I knew I was on 2.01 but I didn't knew exactly what, so I was running around frantically trying to find out what my time was, but it was really good. I'd had couple of 2.01 races where I'd run wide on some bends so I knew it was there. It was just getting in the right race, running the minimum distance and it happens." Galligan’s was not the only supreme Gloucester performance on Friday. 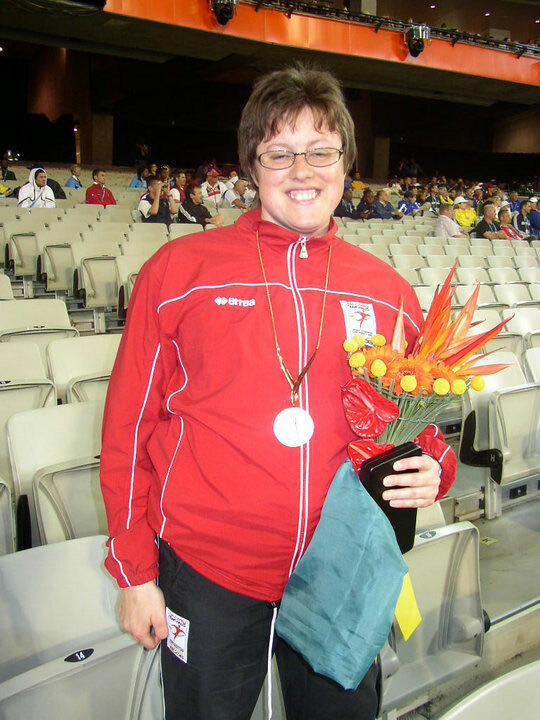 Her Gloucester AC club-mate Beverley Jones was repeating her bronze-medal winning performance from last year’s Paralympic Games, taking the bronze medal in the F37 discus at the IPC Athletics Championships in Lyon, France. Jones’s best throw was 28.54m. 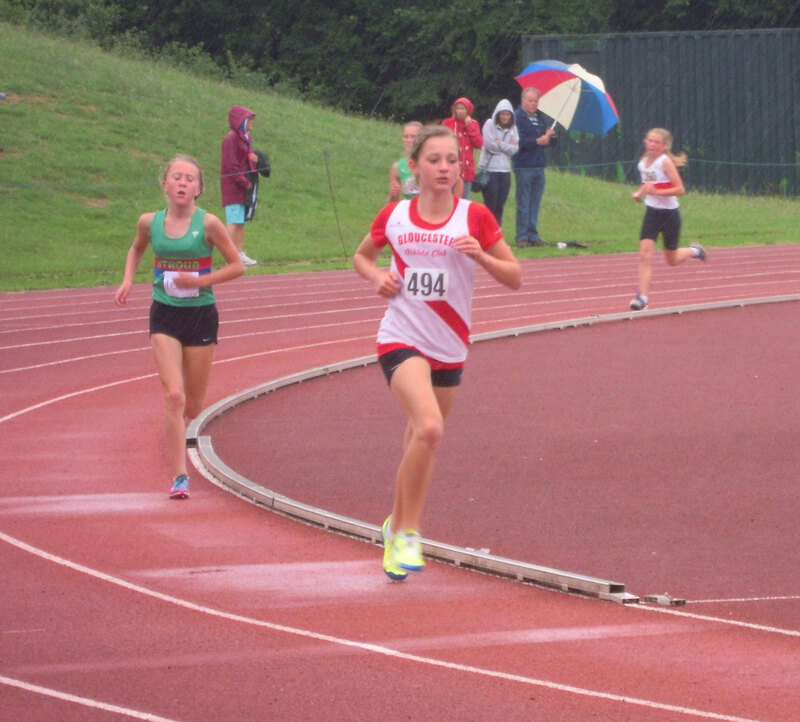 Two of the Gloucester club’s youngest 800–metre runners hoping to follow in Rose-Anne Galligan’s footsteps were celebrating personal bests at the Cheltenham Mid-Summer Open Meeting on Wednesday (24th). Alidia Vaile (12) lowered her 800m personal best to 2:37.2, whilst training partner Jude Dowdeswell (also 12) knocked six seconds off her best to 2:52.7. For the second time in two weeks, Gloucester Athletic Club shall be featured on national television this weekend (Sat 27th). Two weeks ago, BBC One’s National Lottery programme included an item on Bob Purcell and the work he has done at the City’s Blackbridge Jubilee Athletics Track. As a result of that appearance, a group of young athletes from the Club shall be filmed pressing the Lottery button from the Olympic Stadium in Stratford as part of their day out as guests of the BBC at the Anniversary Games. In addition, one youngster from the Gloucester club shall be selected to take the relay batons out onto the track ahead of the 4 x 100m relay event. The National Lottery programme is scheduled to be screened on BBC One between 20:50 – 21:40 on Saturday evening. Gloucester Athletic Club’s Nathan Smith finished fourth overall and second senior man in five minutes exactly at the Bourton Road Runners One Mile event, incorporating the County One Mile Road Championships, on Saturday (20th). Hayley Winters finished second senior lady and first in the County category in 5:36, with Arthur Daley finishing in 6:02. Daley was disappointed with his run, even though he still placed 3rd in the M60 category. Dave Spackman clocked 6:32 to win the M65 category and Denise Evans lowered her one mile best time by over 40 seconds to record 6:45 and take second place in the W50 age group. 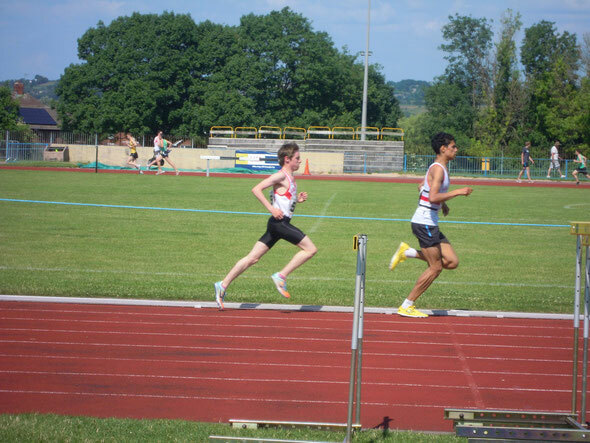 Two Gloucester AC members, Alex George and Richard de-Camps, were in action at the BMC Meeting at the historic Iffley Road track in Oxford on Saturday (20th). The iconic venue was chosen to celebrate the 50th of the British Milers Club and saw the 1500 metres races replaced by the classic one mile event, with many runners aiming to dip under the still-magical 4 minute barrier. Unfortunately, a strong and blustery wind throughout the meeting put paid to many athletes’ ambitions this time, so it all came down to the racing. As a result of his startling breakthrough over 1500 metres in Manchester last month, Alex found himself taking a major step up in class and was drawn in a race that included a number of GB internationals. Sticking to his task, the Gloucester youngster produced his customary late finish to move through the field to finish a very creditable 7th in 4:10.48, beating one of his main rivals this year, Liam Dee of Shaftesbury Harriers who recently represented GB at the World Youth Olympics, along the way. The time ranks him 5th fastest U20 in the UK this year, a remarkable achievement given that that he still has two more years in this age group. His time was a new club U20 record, knocking 5 seconds off the previous record set by Steve McHale back in 1969. Richard chose to run his more familiar 800 metres event after a difficult week which had seen him unable to train after a violent reaction to an insect bite on the leg. In an unevenly paced race, Richard took the running up on the second lap and placed 6th in 1:55.74, just two tenths outside his personal best. Gloucester Athletic Club’s Anna Robertson improved her personal best in the hammer throw when recording 47.66 metres at the Birmingham Games on Saturday. Robertson (24) has been the Club’s top thrower during 2013, producing the most consistent form of her life and this was the first time she has thrown over 47 metres. Gloucester Athletic Club members made the short journey up the M5 to compete in the Worcester AC Open Meeting last Thursday. Throughout this season it has been the Club’s younger track stars who have been stealing the headlines and again they were in fine form but the stand-out performance of the evening came from M40 veteran Paul Barlow who knocked a massive 17 seconds off his 3000 metres personal best when placing second in 9:11.1. Barlow has been reaping the benefits of joining Paul de-Camps middle distance training group at Gloucester and this was his second personal best in eight days, having reduced his best time over 1500 metres by a large margin the previous week at Cheltenham. Barlow will now turn his attention to the British Masters Championships in September. Dayna Willoughby was another City athlete to benefit from competing in the warm conditions at Worcester. She won the 200 metres in a new personal best time of 25.5 seconds, before equalling her best over 400 metres with 59.0 seconds in second place. Willoughby’s training partner, Kelly Constable took second place in the 200 metres in 25.9 seconds, while another member of Paul Pepler’s training group, Andrew Bowers, placed 3rd in the 400 metres in 54.2 seconds. Last but not least, Alex George was a clear winner of the 800 metres in 1:58.0. Simon Fortnam was Gloucester Athletic Club’s first finisher in the Severn AC White Horse 5km road race at Sandhurst, when placing 18th in 17:24. Jeremy Mower was next to finish, 22nd in 17:55, with Matt Powell placing 31st in 18:28. Gloucester Athletic Club’s Gareth Winter placed 5th in the senior men’s shot putt final at the Sainsbury’s British Athletics Championships incorporating the World Championships Trials at Birmingham on Sunday (14th) with a best throw of 15.93m. In her final race before flying out to Europe for high-altitude training ahead of next month’s World Championships, Gloucester’s Rose-Anne Galligan was a comfortable winner of the senior ladies 800 metres race at the BMC Gold Standard meeting in Watford on Wednesday (10th). Galligan stopped the clock in 2:04.56, over five seconds ahead of the rest of the field. Gloucester Athletic Club was well-represented at the Cheltenham Mid-summer Open Meeting last Wednesday (10th), with many athletes coming away with wins and personal best performances in the warm conditions. Gareth Winter was dominant in the throwing events, recording clear victories in both the shot putt and discus events. In the ladies throws, Ellen Thrall set a season’s best in the U17 Ladies discus with 24.07m for second place, a position she repeated in the shot putt. On the track, Dayna Willoughby continued her good form, taking a double victory in the U17 Ladies 100 and 200 metres with training partner Kelly Constable placing third in both events. Newcomer Tainne Finn placed second in the U17 men’s 100 metres race. Another athlete to record a sprint double victory was Luke Hill in the U15 Boys category. His sister Amelia won the 100m race in the U13 Girls age group whilst Lewis Drewett took 2nd place in the U13 Boys 100m. The 600 metres saw a host of new personal best times for the Gloucester runners. In the men’s event, Richard de-Camps (2nd), Alex George (3rd), Andrew Bowers (5th) and Ryan Hearn (6th) all reduced their best times in this rarely-run event. 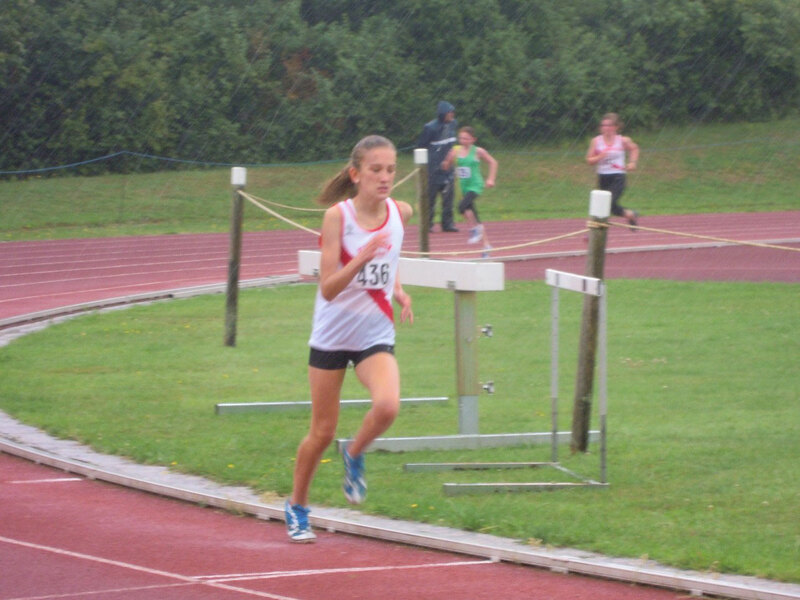 In the mixed juniors 600 metres race, new middle-distant prospect Alidia Vaile produced another impressive performance with a personal best time, whilst Briony Bishop narrowly won the U13 Girls 1500 metres. Paul Barlow took seven seconds off his personal best in the men’s 1500m, his time of 4:19.5 ranks him in the top 10 V40 in the UK, whilst Harry Wells won a close-fought 1500m ‘B’ race. Heptathlete Kate Davies competed in just one event, the 100m hurdles, placing second. 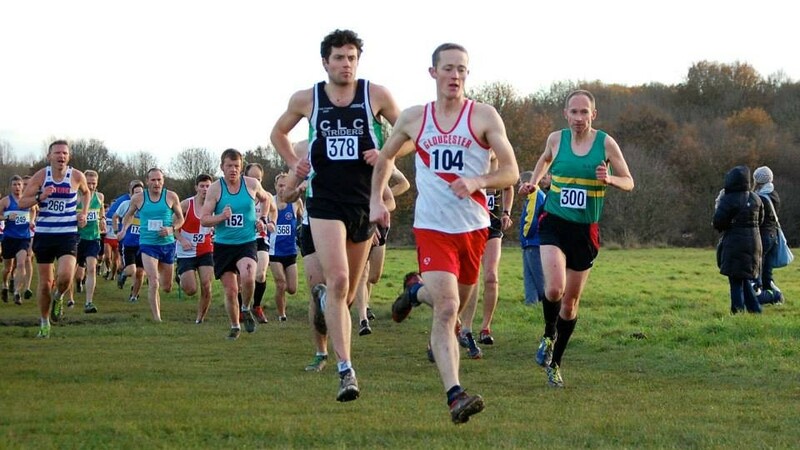 Former Gloucester AC cross-country captain Dave Gresswell continued his comeback from injury and illness by placing second of the City club’s contingent home in this year’s Frampton 10km road race on Monday (8th). Gresswell placed 18th overall in 38:15, just holding off club-mate Matt Powell, who finished 20th in 38:19. Jeremy Mower was the first man home for the club in 12th place with a time of 37:12. Hayley Winters carried her recent good form into this race, finishing first lady in a new personal best time of 38:28. Behind her, James Head placed 30th in 39:26, Arthur Daley took the M60 prize, placing 73rd in 41:53, Nick Bishop placed 122nd in 44:47 and Denise Evans finished in 181st place in 48:19. Gloucester Athletic Club’s senior track & field team produced their best performance of the year to take second place in the Plastics Plus Ltd-sponsored Midland Athletics League Division Two fixture at Stoke on Sunday (7th). The team included several of their juniors who had competed in the English Schools championships over the previous two days and they showed few signs of fatigue in the hot conditions. On the track, twins Thomas and Alex George both recorded comfortable wins in the 800m and 1500m ‘B’ races respectively and Dayna Willoughby marked her 400 metres debut with a narrow win in the ‘B’ race in 59.0 seconds. In the field, Jacob Lange made his debut for the senior team and was not fazed by the opposition as he took a convincing win in the ‘A’ string hammer. He backed this up with two third places in the ‘B’ string shot putt and discus, providing solid support to Gareth Winter who repeated his customary double victory. Lauren Richards took second place in the ‘A’ shot putt and third place in the discus as she and Anna Robertson ensured that Gloucester once again earned good points in the throwing events. The team was boosted on the track by the appearance of Irish international Rose-Anne Galligan who used the match as vital preparation towards her World Championship selection bid. Galligan was a class apart as she won the 200m ‘B’ race in a new personal best 25.7 seconds before recording a convincing win in the 400m ‘A’ race. Heptathlete Kate Davies continued her run of good form. She recorded victories in the long and high jumps, took second place in the javelin and fifth place in the 800 metres before running the final leg in the 4 x 400m relay team. The result leaves Gloucester in fourth place overall but just three league points behind Stoke in second place and with the final match taking place at Gloucester’s home track at Blackbridge in August, promotion cannot be written off. Gloucester Athletic Club’s youngsters were in excellent form at the English Schools’ Championships held at Birmingham’s Alexander Stadium at the weekend (5/6th). The two-day Championships are the pinnacle of a young athlete’s career and with the selection process being so challenging, only the very talented qualify for the event. The first City athlete to enter the arena was Jacob Lange in the senior boys hammer and he produced the best series of his life as he improved his personal best with the 6kg weight no few than three times during the competition. His best throw of 56.92m earning him sixth place. Lange’s training partner and another member of Lorraine Shaw’s training group, Charlotte Stallard, was next to compete. Stallard was hoping to go one better than last year, when she won the silver medal in the senior girls hammer but, despite throwing further than last year, she finished in sixth place with a best throw of 43.59m. Dayna Willoughby was making her debut at these championships and did not disappoint as she took 3rd place in her intermediate girls 300 metres heat in a new personal best and club record 40.41 seconds. That performance was good enough to qualify for Saturday’s final where she placed 7th in 40.68 seconds. Another to set a personal best on the first day was Thomas George in the senior boys 1500 metres. He improved his previous best time by over three seconds when placing sixth in his heat in 3:55.88 to qualify for Saturday’s final. That race was a tactical, slow run affair and Thomas was unable to re-produce his time of the previous day, coming home in 11th place with 4:00.79. On Saturday, youngster Ellen Thrall was just 1cm down on her personal best in the intermediate girls hammer competition, placing 12th in the final with 36.68m. 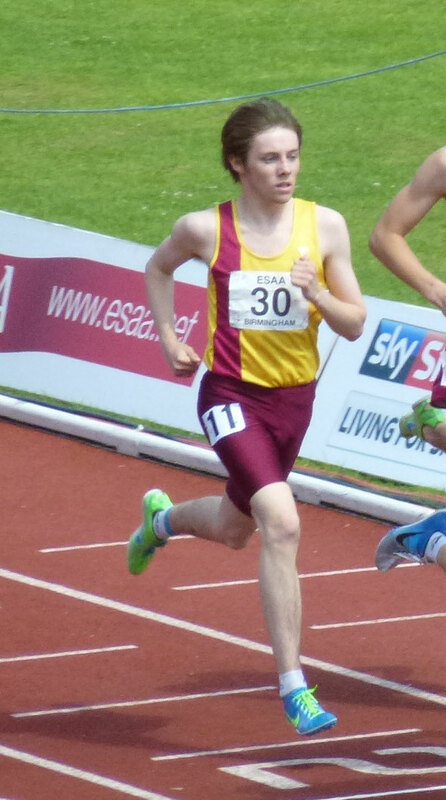 The senior boys 3000 metres saw Alex George line up with a real chance of a medal. Despite giving it his all, he placed a very credible 5th in 8:34.46. At the U17/U20 National Youth Development League match at Stourport-on-Severn, Jacob Lange recorded wins in the javelin and discus and also his speciality, the hammer, in which he competes in the English Schools. Dayna Willoughby recorded a comfortable win in the U17 Ladies 300 metres at Stourport and Ellen Thrall was also a victor in the U17 Ladies discus. There were many more notable performances at the Development League fixture, the highlight of which being a new U17 Ladies Club record in the 4 x 300 metres. Catherine Hardy, Adella Hill, Kelly Constable and Dayna Willoughby recorded a new club best time of 3:04.4 seconds. Megan Teague set a new personal best in the triple jump, adding over 30 cms on her previous best with a new mark of 9.42 metres, as she took victory over club mate Libby Taylor. 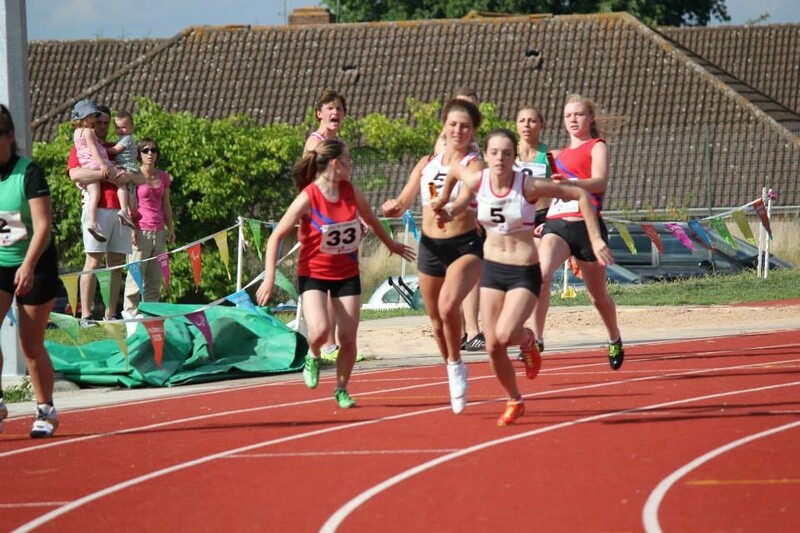 Gloucester Athletic Club’s Rose-Anne Galligan continued her recent run of good form when clocking 2:02.04 in 4th place in the women’s 800 metres in Reims, France last Friday (28th). Two Gloucester Athletic Club members competed in the latest Pomphrey Sports 5km road race in Bristol. Arthur Daley placed 70th overall and 3rd in the M60 category in a season’s best 20:36, whilst Mike Anderton placed 128th in 28:18. Alex and Thomas George travelled up to Manchester to compete in the BMC Gold Standard meeting where Thomas lowered his 800 metres personal best with 1:56.45 and Alex knocked five seconds off his 1500 metres best with stunning 3:49.89 – the fastest time by a Gloucester club runner for twenty years. Richard de-Camps also travelled up to Stretford to compete in the 1500 metres where he came away with a new personal best 3:57.38. Gloucester Athletic Club’s top multi-event athlete Kate Davies produced one of her best-ever performances when taking silver medal in the South West Schools senior girls Heptathlon at Exeter. She set new personal bests in the 100m hurdles (16.91 seconds), 9.79m in the shot putt and 5.02m in the long jump along the way to recording a score of 4157 points. She will now go forward to compete in the English Schools combined events championships in September. In the Midland Counties U20 Championships at Birmingham’s Alexander Stadium on Saturday, Alex George took silver medal in the 1500 metres in 4:14.6, with his twin brother Thomas taking the bronze in 4:16.0. Gloucester Athletic Club’s Steve Millward and Richard de-Camps each won medals at the Midland Counties Senior Championships in Birmingham on Sunday. Millward took the silver medal in the 3,000m steeplechase in a season’s best 10:01.48 whilst de-Camps won the bronze medal in a tactical 800 metres in 2:00.1. Charlotte Stallard took the silver medal in the U20 Ladies hammer throw, recording 44.01 metres. Gloucester Athletic Club’s young stars of the future were in action at the U13/U15 National Youth Development League match at Swindon, achieving four wins and setting several personal bests during the afternoon. The performances of Alidia Vaile in the U13 Girls 800m and George James in the U15 Boys long jump, in particular, stood out. Alidia was content to sit in with the leading group in her race before putting in a decisive break with 150 metres remaining to leave the field in her wake. Her winning time of 2:37.3 was an improvement of three seconds on her previous best. George made the long jump a one-sided contest with a superb leap of 5.88m, the furthest jump by a City athlete in any age group this year. He complimented this with a second place in the 100m in 11.9 seconds. Luke Hill and Lewis Nicholls both won their 100 metres races, in 12.0 and 14.5 seconds respectively, whilst Harry Matthews took second place in his race in 14.0 seconds. Personal bests were set by Alex Evans in the 75m Hurdles, Chloe Jones and Amelia Hill in the shot putt and Briony Bishop in the 1200m. Gloucester Athletic Club’s Beverley Jones has been selected to represent Great Britain and Northern Ireland at the International Paralympic Committee (IPC) World Championships in Lyon, France at the end of the month. Jones, who won the bronze medal in the discus at last year’s London Paralympics, will compete in the F37 category of the discus and shot putt. Due to popular demand, Gloucester Athletic Club is setting up a new recreational running group. The Blackbridge Beginners group is aimed for those people over 18 years old who want to run to keep fit and for recreation. Led by new coach Donna Veal, the sessions shall start this Thursday (4th July) from the Gloucester club’s Blackbridge headquarters at 6:30pm and shall include varied runs over grass playing fields, roads and the canal towpath, depending on the season and session. For further information, please ring 07817 974630. The 2013 Cranham Beast multi-terrain race will be on Saturday 10th August, starting at 3.00pm. Race venue is the Cranham Cricket Club. Entry fees are £8 for unattached runners, or £6 if you are a member of a UK Athletics affiliated club. There is no surcharge for entries on the day. Full details are on the Gloucester AC website, www.gloucesterac.co.uk/events/club-events/cranham-beast. 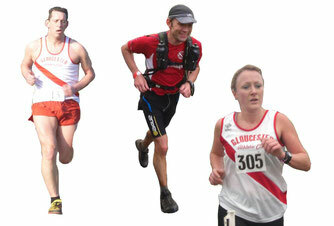 The date for next year’s Gloucester 20 Mile road race has been set for Sunday 16th March 2014. Entries and full details shall be announced through the club’s website later this summer. 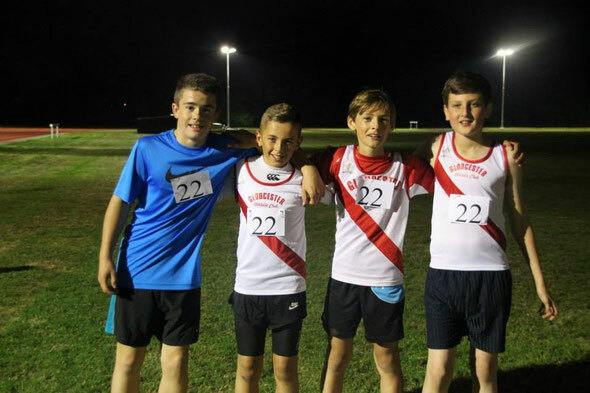 Six of Gloucester Athletic Cub’s leading junior athletes have been selected to represent Gloucestershire at next month’s English School’s Championships. The Championships, which are the highlight of a young athlete’s season, take place at Birmingham’s Alexander Stadium on 5th and 6th July and shall feature the very best of the country’s young athletic talent. Twins Thomas and Alex George and Jacob Lange shall be competing in the Senior Boys age group. Thomas George shall be running in the 1500 metres whilst Alex, like his brother a member of Paul de-Camps’ training group, shall line up in the 3,000 metres. Lange, who is coached by Lorraine Shaw, will be competing in the hammer event. Another member of Shaw’s group, Charlotte Stallard, shall be competing in the Senior Girls hammer. Sprinter Dayna Willoughby shall run in the Intermediate Girls age group. A member of Paul Pepler’s training group, she’ll be lining up in the 300 metres. The sixth City athlete to be making the trip to “the Nationals” is Ellen Thrall who, at 15, is the youngest member of the Gloucester contingent. Also from the Lorraine Shaw stable, she shall be competing in the Intermediate Girls hammer. Gloucester Athletic Club youngsters were in fine form at the South West Schools Championships at Exeter on Saturday (15th). In the senior age group, there was a double gold medal success for the George twins as Thomas and Alex both ran tactical races before unleashing strong finishes to take the 1500m and 3000m titles respectively. Kate Davies was a double silver-medallist in the senior girls section, taking second place in both the high jump (1.55m) and javelin (32.60m). There was further success in the Inter Girls section as Dayna Willoughby took the 300m title in 41.51 seconds, a time that was hampered not only by the blustery conditions but also a team selection anomaly that meant she was also entered for the 200 metres event which was less than 30 minutes before her 300 metres final. Willoughby’s training partner, Kelly Constable, showed she is recovering from an ankle injury that threatened to end her season prematurely by taking second place in the 200 metres final in a season’s best 25.72 seconds. Catherine Hardy ran a personal best 12.53 seconds to qualify for the 100 metres final, where she ran even faster to take the bronze medal in 12.41 seconds. Hardy was later a member of the 4 x 100m relay squad that took the gold medal. In the Inter Girls field events, Ellen Thrall added a metre to her personal best as she took the bronze medal in the hammer event with 36.69m. In the junior girls category, Cheyna Nicholls won the bronze medal in the shot putt with 9.70m. Inter Boys 800m final - 9th Ryan Hearn; 11th Dominic Tutton. Two of Gloucester Athletic Club’s promising young throwers were in action at the England Athletics U20/U23 Championships at Bedford on Saturday (15th). Jacob Lange took 10th place in the U20 Men’s hammer final, whilst club-mate and fellow member of Lorraine Shaw’s training group, Charlotte Stallard also took 10th place in the U20 Women’s hammer final. Tim Williams, currently studying at Loughborugh University, competed in the U23 event, finishing 5th with a best throw of 59.78m. Gloucester Athletic Club’s Rose-Anne Galligan took a significant step towards the World Championships in Moscow as she smashed her personal best. In her second international race in four days the 25-year-old Gloucester AC Irish international won the 800m in Huelva, Spain, in a time of two minutes, 1.07 seconds to shave 0.69 seconds off her previous best set in 2010. Most importantly, the Cheltenham-based athlete's time is inside the World Championships B qualifying standard of 2.01.50 and puts her in a strong position to win a place in the Ireland team for the event in Moscow in August. Her coach David Farrow said: "These are really good times for Rose-Anne and I think she is coming of age as an athlete. "That was her second race abroad in four days and to put two times of 2.01 back to back with a lot of travelling in between is very impressive." Galligan returned home to Gloucestershire on Sunday after her race in Turin, trained hard with Farrow and then took a train to Stansted on Monday for an early morning fight to Spain on Tuesday. But not even that hectic schedule could throw Galligan off track as she followed the pacemaker to the bell and then shot to the front and raced to victory. Farrow said: "Rose-Anne was bold enough to take on the race, control it and run a very strong and steady second lap. "She is really growing as an athlete, understands the event properly and is becoming more and more confident." The time lifts Galligan to third in the Ireland all-time rankings headed by Sonia O'Sullivan. It could be only be a matter of time before the Gloucester AC star breaks O'Sullivan's 1994 record of 2.00.69. The Gloucester-Severn composite team produced a much-improved performance at the second Midland Athletics League Division Two match at Birmingham University on Sunday (9th), taking a well-earned third place on the day. The team welcomed back several athletes who were unavailable for the opening match and they all played a big part in a strong all-round team performance that was full of quality in every department. Whilst the young sprinters continue to make their mark on this stage, it was the middle distance runners who really set a standard that will be tough to beat this season. Tim Dalton took an impressive 800/1500m double, with solid support from Ryan Hearn and Thomas George, whilst Alex George and Richard de-Camps took excellent wins in the 3,000m ‘A’ and ‘B’ strings. The runners did not have things all their own way, however, as the throwers dominated the opposition. British Universities champion, Tim Williams, got the team off to a winning start when he and Justin Sysum took wins in the men’s hammer event. Sysum and Gareth Winter each secured victories in the shot putt and discus ‘A’ and ‘B’ events and Sysum also took a second place in the ‘A’ string javelin. The ladies team have impressed this year. The throwers, whilst not repeating their heroics of the first match, still produced solid performances to earn valuable points throughout with youngster Lauren Richards setting a new outdoors best to win the shot putt. Libby Taylor and Megan Teague set three new personal bests between them in the long and triple jumps and Kate Davies made a huge impression in her first major outdoor competition of the summer. However, the ladies saved the best for last as the sprint relay team of Sophie Lambert, Dayna Willoughby, Catherine Hardy and Kelly Constable knocked over half a second off the existing club record with 49.8 seconds, the first time a City squad has ever dipped below 50 seconds for the event. Gloucester Athletic Club’s Rose-Anne Galligan ran her second fastest-ever 800 metres and her quickest time for three years when she placed 4th in the Primo Nebiolo Memorial meeting in Turin, Italy on Saturday. Galligan stopped the clock at 2 mins 01.83 seconds, just seven one-hundredths of a second outside her personal best time set when running in the European Championships in Barcelona in 2010. 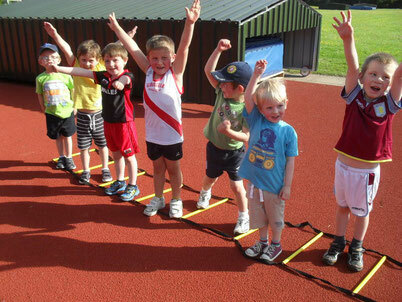 Gloucester Athletic Club is now holding athletics sessions for the very young. The “Kwik Kids” scheme has been initiated due to the demand from parents and caters for the 4-7 year-old age group. The “Kwik Kids” group meets every Tuesday afternoon between 5:00 - 6:00pm at the Blackbridge Jubilee Athletics Track in Podsmead and everyone is welcome. Many of Gloucester Athletic Club’s young track & field athletes were in action at National Youth Development League matches over the weekend. The U13 and U15s team travelled down to Swansea on Saturday (1st) and the U17 and U20s travelled to Brierley Hill on Sunday, all producing performances that will give senior coaches much hope for the future. In the Pomphrey Sports Summer Series 5km road Race in Bristol (29th) Gloucester AC’s Arthur Daley placed 31st in 21:22 whilst Nicola Hovey placed 47th in 23:25. Gloucester Athletic Club’s George twins travelled up to Birmingham University to compete in the BRAT/British Milers Club event. 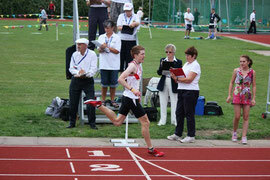 Thomas lowered his five day-old 1500m personal best, finishing 2nd in 3:58.39. Club-mate Richard de-Camps placed 6th in 3:59.56.The 3,000m race saw Alex George start off conservatively before unleashing a 60-second final lap to come home the winner in 8:44.92. 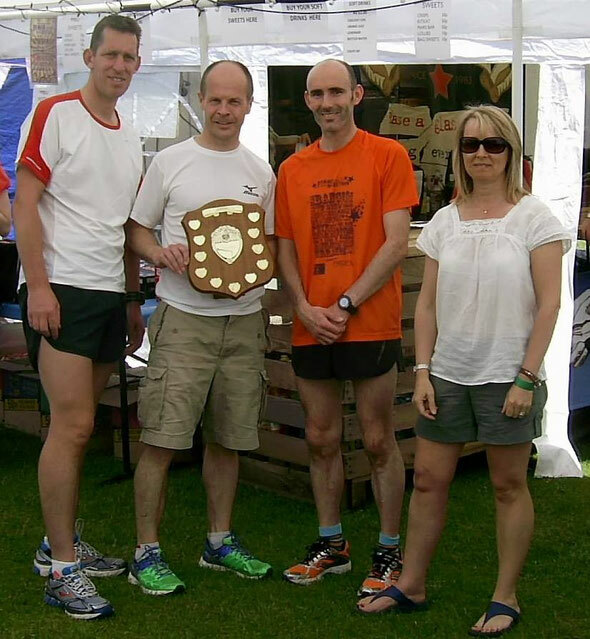 Gloucester Athletic Club were awarded the team shield for finishing first team of three at the Dymock Half Marathon on Sunday. A field of over 130 runners took part in hot conditions over the hilly half marathon course which was mainly along country roads through Dymock Village, along the Ledbury Road, Much Marcle and back through Dymock to finish at the local cricket club. Mike Mansfield running his fastest half marathon for a few years led the team home taking 3rd place and 1st Vet 40 in a time of 1:22:17. He was closely followed by team mate Jeremy Mower finishing 4th place, 1st Vet 45 in 1:23:30. Final scorer was Ian Summers running his first half marathon since Malta six years ago was 14th in 1:31:58. 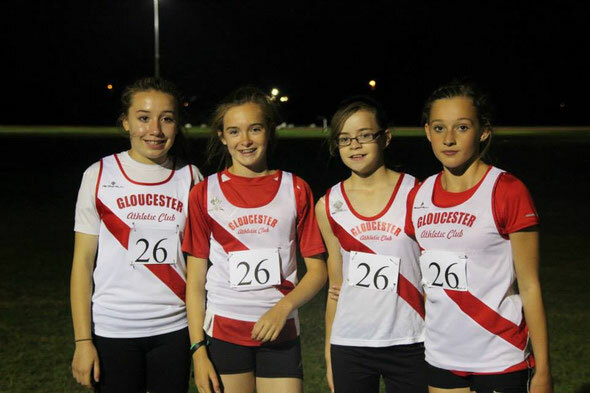 There were medals and personal bests aplenty for Gloucester Athletic Club members at the 2013 Gloucestershire County Championships at Cheltenham last week, making it one of the most successful championships in the Club’s recent history. A hugely successful recruitment campaign on the back of the 2012 Olympics and the brand-new Blackbridge facility has swelled the number of members at the Gloucester club and this was the first County Championship for many of those newcomers and they did not disappoint, bringing a whole stash of medals back to the City. The timing of these successes could not be better because the Club launches its new Junior Athletics Academy this week. 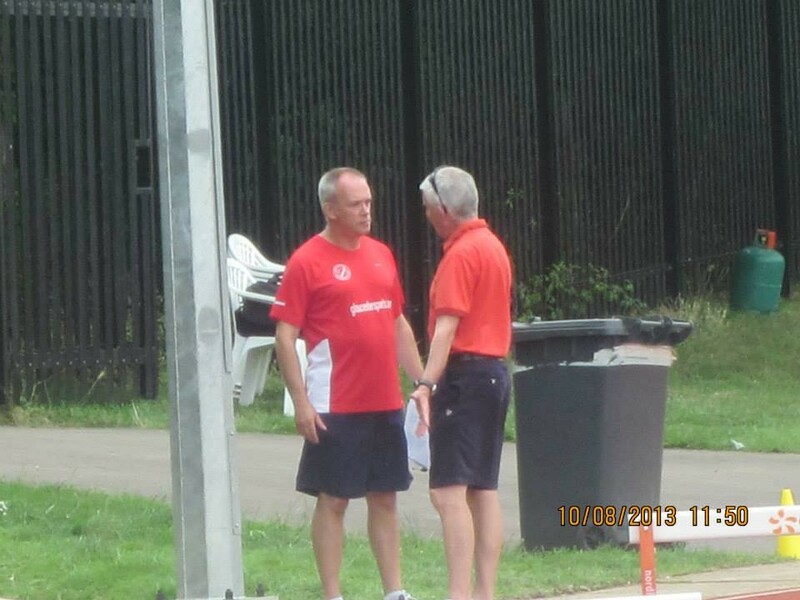 Club coaching Co-ordinator, Paul Pepler, explains: “The new structure means that we are now in a position to offer led coaching sessions for a full range of athletics events for everyone from the age of seven years and upwards. Gloucester Athletic Club trains each Tuesday and Thursday at their Blackbridge headquarters in Podsmead, 6:30-8pm. Gloucester Athletic Club’s Anna Robertson was in record-breaking form at the recent Herefordshire County Championships recently (25th), taking a treble of gold medals. Robertson has established herself as the leading City thrower this summer and continued her good form, setting new personal bests and new county records in the hammer (46.84m) and discus (28.28m). She also won the shot putt, in 9.95m. There was a strong Gloucester Athletic Club presence at the Loughborough International event on Sunday 19th May. Rose-Anne Galligan ran a season’s best 2:03.19 in the ladies 800m, taking second place behind the outstanding Jessica Judd, whilst Gareth Winter placed seventh in the men’s shot putt with 15.91m. British Universities champion, Tim Williams, placed 8th in the men’s hammer with a season’s best throw of 60.52m. Gloucester Athletic Club’s hopes of an immediate return to the top flight of the Midland League took a set-back when they placed fifth of six teams in a tight opening match at Yate on Saturday. Injuries and non-availabilities had robbed the team of several key members but there were still several very encouraging performances from youngsters making their senior team debuts that will have pleased selectors and coaches alike. The young sprinters all acquitted themselves well, with Ben Potts and Jevaughn Gayle (100m) and Jools Richardson (200m) all set new personal bests. They were perhaps outshone by another youngster, Catherine Hardy, who took a double victory in the 100m and 200m, the latter in a new personal best. 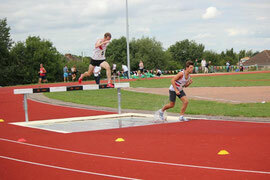 Best times were also set by Ryan Hearn (800m), Tom Beckett (long and triple jumps) and Libby Taylor in the 100m hurdles. Despite fielding a very young team, it was some of the older hands who held the team together. Captain Steve Millward set a captain’s example, competing in six events, whilst throwers Gareth Winter and Anna Robertson both produced solid performances during the match. Robertson had one of her best-ever days in a Gloucester vest, setting new personal bests in the discus and javelin as well as being less than half a metre down on her hammer best. Even Club Chairman Andy McKenzie was tempted out of retirement and claimed 3rd place in the B hammer after not even having touched the implement for seven years. Four Gloucester Athletic Club members travelled to Solihull for the BMC Grand Prix meeting on Saturday, with all four coming away with personal or season’s best performances. Irish international Rose-Anne Galligan had a successful winter indoors campaign, culminating in the European Indoors Championships in March, and she opened her outdoor season in sparkling fashion, winning the 800m ladies event in 2:04.08. Richard de Camps and Thomas George both lowered their personal bests in the 800 metres, clocking 1:55.55 and 1:56.48 respectively, whilst Alex George set a new best time of 3:54.83 in the 1500 metres. Irish international Rose-Anne Galligan opens her season with a double-header this weekend. The Gloucester AC runner, who lives in Cheltenham, is entered for the women's elite 800m race in the opening British Milers Club Grand Prix in Solihull. And the following day she will tackle the same distance in the Loughborough International Games. "Rose-Anne will be a bit ring-rusty as she has only just returned from a few weeks of hard training in South Africa and then Font Romeu in France," said her coach David Farrow. "She needs a few races to get herself going again so it is game on." The two events will be Galligan's first taste of competitive action since reaching the semi-finals of the European Championships in March, when she clocked an indoor personal best of two minutes 2.84 seconds. A slight foot injury forced her to rest after that event but since then Galligan has been training hard at altitude – though this weekend will probably come too soon for her to enjoy the full benefits of that advantage. Ultimately Galligan's target this season is to improve upon her outdoor personal best of 2.01.76 which she set three years ago at the European Championships in Barcelona and qualify to represent Ireland at the World Championships in Moscow. "You normally don't want to race within seven or eight days of coming back from altitude as you are not at your best, but for Rose-Anne that isn't so important at the moment," added Farrow. "It is three weeks down the line that we should see the full benefits and Rose-Anne has a high quality 800m in Germany pencilled in for then (May 31st) which will be her first really serious race. "But first she has the two races this weekend and then will probably do something different at the Gloucestershire Championships the following weekend." Mark Thrall, Lofty Summers, Rich Moor and Gemma Collier took part in the 33 mile Marlborough Downs Challenge. All finished the undulating multi-terrain course in under 5 hours 30 mins. Mark was first home in 5 hours 21 mins, followed by a team consisting of Rich, Lofty and Gemma who finished in 5 hours 26 mins. All finished in the top 50, with Gemma also finishing 4th lady, a great result considering that she completed London Marathon only a few weeks earlier. Collier said "it was a great event with a testing yet scenic course that made great use of some spectacular countryside". Gloucester's next multi-terrain team event will be the Cotswold Way Relay on the 29th June. Please contact Lofty for details. Gloucester Athletic Club’s Dave Spackman took 1st place in the V60 category of the Aviator 4-mile road race at the Gloucestershire Airport, Staverton, on Sunday. The 67 year-old veteran clocked 29:45 to extend his lead in the category of the County Road Race series.Spackman’s club colleague, Denise Evans, ran 29:40 to take the W50 category. Gloucester Athletic Club’s sprinters have made their most encouraging start for several seasons, raising hopes that their recent drought is coming to an end. For the past few seasons the City club has, surprisingly given its rich tradition, struggled to raise sprint teams to challenge the rest of the county. However, there are signs are that the drought is coming to an end as several of the Club’s sprinting talent are posting times to make the rest of the region sit up and take notice of the revolution that is taking place at the Blackbridge track. Leading the way at the moment are the U17s. Kelly Constable, Dayna Willoughby and Catherine Hardy are placed towards the top of the South West ranking lists over 100, 200 and 300 metres for the girls and new talents Jevaughn Gayle and Julian Richardson are showing huge potential in the boys events. The change in the Club’s fortunes can be put down to several factors: the Olympic Effect is very much alive in the City, with dozens of newcomers having joined the Club over the past 10 months; floodlighting at the newly refurbished Blackbridge Jubilee Athletics track has meant that the athletes could train outdoors during the winter months; the experienced sprint coaching team of Paul Pepler, Garry Hunter and Richard Blackwell has brought a new energy into the sprint group; and last, but not least, is the fact that there is some genuine athletics talent in the group. Gloucester Athletic Club trains each Tuesday and Thursday, 6:30-8:00pm, at the Blackbridge Jubilee Athletics Track, Podsmead. Everyone is welcome, ring 07817 974630 for more details. Kathryn Purcell made the long journey to Kent to compete in the Whitstable 10km road race and, in hot conditions, placed 13th lady and 82nd overall in a field of over 700 runners in 44:16. Gloucester Athletic Club’s Tim Williams retained his senior men’s hammer title at last week’s British Universities Championships at Bedford. Representing Loughborough University, the 22 year-old threw a season’s best 58.87m to repeat his victory at the Olympic Stadium in London last year and, as a result, has been selected to compete in this weekend’s prestigious Loughborough International event (19th). A group of Gloucester Athletic Club’s younger members travelled to Braunton in north Devon to compete in the U13/15 categories of the National Youth Development League on Saturday (4th) with the sprinters in particular taking advantage of the windy conditions to post new personal best performances. In the U15 Boys age group, Luke Hill continued his promising start to the new season as he recorded new bests of 11.9 and 24.9 seconds when placing second in both the 100 and 200 metres. The U15 Girls age group saw Chloe Jones set a trio of new personal bests, in the 200m (29.8 seconds), discus (18.48m) and shot putt (6.40m). The U13 Girls were not to be out-done when it came to setting new bests. Tamsin Doran gave further evidence of her potential as a multi-eventer as she set new standards in the 75m (11.0 seconds), long jump (3.82m) and the shot putt (6.77m) whilst Amelia Hill set new bests of 11.3 secs (75m) and 14.4 secs (70m hurdles). Gloucester Athletic Club made a successful debut in the National Youth Development League at Hereford on Sunday (28th), finishing second on the day after leading the match right up to the final few events. Personal best performances were again in abundance with the sprinters in particular taking advantage of the favourable conditions. “We are now seeing the results of the Olympic Effect and the benefits of having a great athletics facility in Gloucester” was how Gloucester Athletic Club’s team manager, Bob Purcell, described the club’s attendance at the opening Avon League fixture at Yate (21st). “It has long been a concern that the Gloucester vest was conspicuous by its absence at these fixtures,” Purcell continued, “but this is the highest number we have ever had at one of the matches and even more remarkable given that it is still only April. ”The Gloucester club uses the Avon League primarily as a development league for its new and less experienced members, but many of its more established U17s chose this fixture for useful early-season competition and came away pleased that they had made the short trip as personal bests tumbled like nine pins. 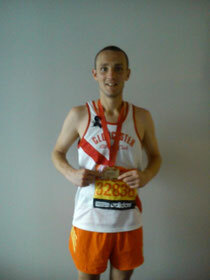 Tom Randles led home Gloucester Athletic Club’s finishers in the 2013 Virgin London Marathon, placing 664th overall in a new personal best time, 2hrs 52.29. He was just ahead of Mike Mansfield who recorded 2:53:34 in 728th place. Next home was Nathan Smith, 1304th in 2:59.50, another personal best. First lady home for the City club was Gemma Collier, 2828th overall, in 3:15:52, again a personal best. Simon Barnes placed 6046th overall in 3:38:19 and Phil duPlessis placed 16120th overall in 4:23:32 to complete a very successful outing for the City club. Gloucester Athletic Club’s Alex George ran the perfect race to win the biggest title of his career, the Virgin London Mini Marathon in the capital on Sunday (21st). The three mile race, which was a pre-cursor to the main Marathon event, doubled as the British Road Race Championship meaning that all of the big names from the UK were present and the 16-year old from Abbeymead did not put a foot wrong, keeping with the leaders throughout before making his move with 200 yards remaining. When challenged down the final stretch, George rallied to hit the front 50 yards from the line to come home the victor in 14 minutes 33, just one second ahead of second placed Zak Miller, representing the North West with Liam Dee of Eastern Counties in third place, a further second behind. Gloucester Athletic Club enjoyed their most successful day at the National Young Athletes Road Relays Championships at Sutton Park, Birmingham, on Sunday (14th). In the U17 men’s event, Ryan Hearn gave the City squad a solid start, handing over to Alex George in 28th position. George made up some 15 places, recording the 5th fastest time of the day (12:01) before passing the baton onto twin brother Thomas who made up a further six places with a speedy 12:05 leg, bringing the team home in an excellent seventh place. In the U15 girls race, Abi Pearce ran the first leg, handing over to Heather Christie in 39th place. Christie made up one place, before handing over to Bethan Moor who ran the team’s fastest leg of the day, making up five places to bring the squad home in 33rd place. Harry Wells gave the U13 boys team a good start, handing over to Alfie Crouch. George Hawthorn made up five places to place 41st for the City team. 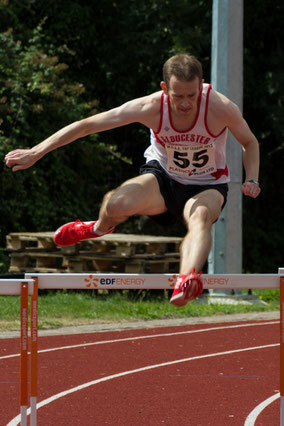 A group of Gloucester AC members opened up their 2013 outdoors track & field season at the Sprints and Hurdles meeting at Yate on Sunday (14th). Andrew Bowers showed that he has wintered well under the guidance of Paul Pepler, setting new personal best performances in the 100 metres (12.24 secs), 200m (24.45 secs) and 400m (54.95 secs), while Dayna Willoughby, Kelly Constable and Lurenda Mudd all showed good early season form in their events. Alex George was considered Gloucester AC’s top performer according to the 2012-13 winter cross-country ranking lists produced last week. George was ranked 11th in the nation’s U17 Men’s age group and was based on a consistently solid season, the highlights of which were taking second place in the McCain’s Cross-Country challenge over four events throughout the winter and an excellent 8th place in the Inter-Counties event at Birmingham in March. In addition, the Abbeymead youngster won the Gloucestershire title and placed second in both the Midland championships and the south-West Schools championships. As a result of these successes, George has been selected for the South-West U17 team to run in the 3 miles mini-marathon ahead of the Virgin London Marathon on Sunday 21st April. Kerry Newell of Gloucester AC competed in the Chedworth 10-mile multi-terrain event on Sunday (7th), finishing 10th lady in 1 hr 22 minutes, an improvement of 13 minutes on her previous best time for the event. 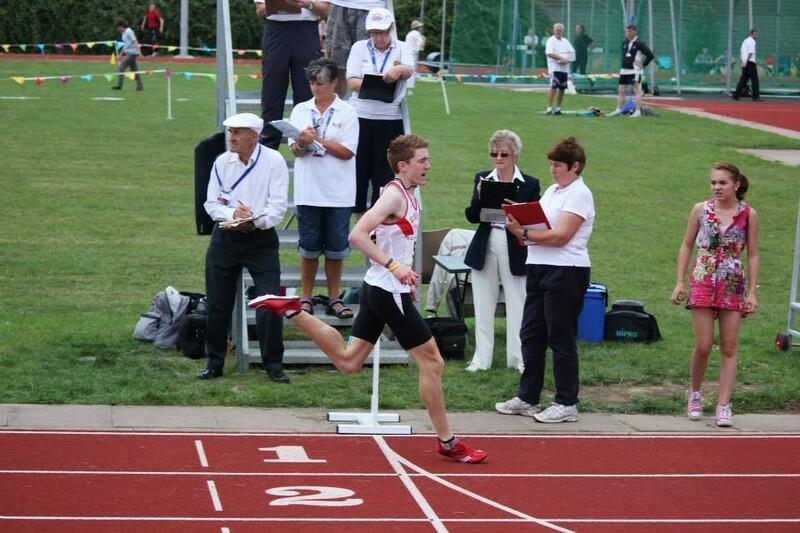 In the fourth Bushley Green Streets One Mile road race near Tewkesbury on Monday, Gloucester AC's James Head placed 11th in 6.03. Gloucester Athletic Club are gearing up for perhaps the busiest season in their 130 year history. The success of the 2012 Olympic Games attracted an influx of youngsters to the club to try their hand at the sport. The refurbished Blackbridge facility that opened in the autumn has also helped the club prepare for a summer of sporting excellence. Chairman Andy McKenzie said: "We were expecting a large increase in training numbers after the Olympics, particularly in the younger age groups, so we trained up several existing members and parents to become qualified coaches. "But never in our wildest dreams could we have anticipated just how much our numbers would swell"To cope with the extra demand, the Gloucester club has entered the National Young Development League for the 2013 season to provide competition for the youngsters. McKenzie added: "One of our main duties as a club is to provide plenty of team competition for all of our members and, by entering the new league, we are increasing the range of competitions available to the youngsters who joined us last year. "In addition to the Junior Development League, we'll be competing in the Midland Athletics League and the Avon League so it will be a very busy summer." Two of Gloucester Athletic club's youngest talents competed in the Lee Valley Open Pentathlon competition on Easter Sunday. Tamsin Doran and Jude Dowdeswell are members of Carlton Blake's multi-events training group at the Gloucester club and both came away with a host of personal best performances. Gloucester Athletic Club's Jeremy Mower was among the 41 runners who braved sub-zero temperatures and biting winds to contest this year's 100km Anglo Celtic Plate in Perth, Scotland on Sunday. This was Mower's ninth appearance for the Welsh team in the event, a record number for any athlete in this competition, and came just four weeks after a win in the Welsh Ultra 40-mile track Championship event at Barry. It was perhaps this proximity that affected the Gloucester athlete over the latter stages. Passing through the classic marathon distance in 3:20 and 50km in 4:06, Mower struggled over the final 15 miles but still managed to place 17th overall in eight hours 46 minutes 20 seconds. Mower said "Despite suffering over the final quarter, I'm relatively happy with that final time seeing as it was so close to the Barry race." Mower has two more ultra-distance races lined up in preparation for a 24-hour race in August where he hopes to record a distance that will be good enough to make the Welsh 24-hour team for the 2015 Ultra Commonwealth Championships in South Africa. Two Gloucester Athletic Club members competed in the Cleevewold 14-mile multi-terrain race which started at Postlip Hall near Winchcombe and covered the highest points of the Cotswolds (24th March). Mark Thrall placed 46th in 2hrs 16:48 and Denise Evans placed 73rd in 2:42:19. Three Gloucester AC members achieved new personal best times in the Club’s Gloucester 20-miles Road Race held around the lanes of Quedgeley and Haresfield on Sunday (17th). Mike Mansfield was the first City runner to finish, in 15th place, in 2hrs 07.53, taking second place in the M40 category. Denise Evans was 3rd in the LV50 section, placing 75th overall in 2:39.55, and Nicola Hovey finished 80th overall and 4th LV40 in 2:41.38. There were team and individual successes for Gloucester AC members at the County short-course cross-country championships at Plock Court on Saturday (16th). The fierce pace set by eventual winner Tom Russell of Stroud split the field, but Gloucester’s Steve Millward settled into a clear second place which he maintained to the finish, reached in 13:44. Dominic Tutton carried his impressive indoors form onto the country and comfortably won the U17 men’s category, finishing in third place overall. Dave Spackman (68) won the MV65 event, finishing in 12th place overall, to ensure the City squad won the senior men’s team prize. Harry Wells, a member of Kerry Newell’s training group, won the supporting younger age group race, with training partner Abi Pearce placing fourth overall and first U15 Girl. Tom Randles and Gemma Collier travelled up to Rhayader in mid-Wales to compete in the ‘Round The Lakes’ 20 miles Road Race on Saturday (16th). In near blizzard conditions, Randles placed 18th overall in 2:16.45 whilst Collier finished in 31st position, and 1st lady, in 2:21.31. Gloucester Athletic Club youngsters were prominent in the Gloucestershire team that competed in the English Schools Cross-Country Championships at Catton Hall in Derbyshire on Saturday (16th). Thomas George made light of the heavy conditions and challenging uphill sections on the course to lead the county team home in the senior boys race to finish in 66th place, six places ahead of twin brother Alex. Bethan Moor brought the curtain down on her impressive first full cross-country season, placing 125th in the Junior Girls race. 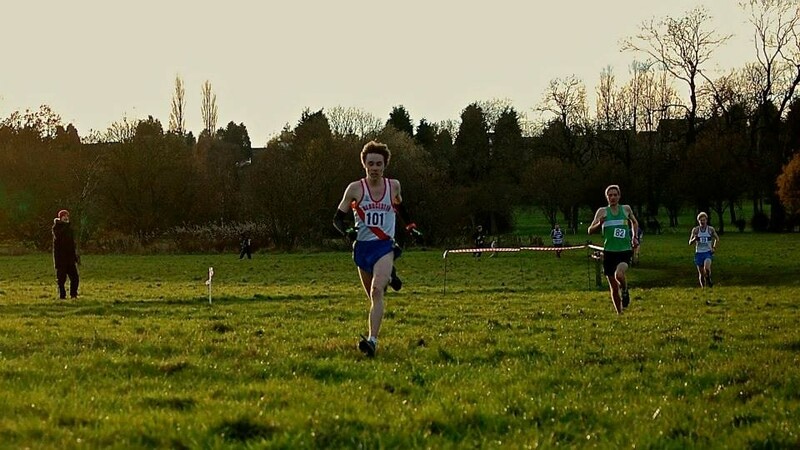 Gloucester Athletic Club’s Alex George produced the stand-out performance at the combined Inter-Counties and McCain’s Cross-Country Challenge at Cofton Park in Birmingham on Saturday (9th). George was in third place going into this, the fifth and final event of the U17 Men’s section of the McCain’s series that has already seen races take place in Bristol, Liverpool, Antrim and Cardiff and with all of the leading contenders present, a tough race was always on the cards. And so it proved, but George stuck to his race plan, keeping in contact with the leading group throughout, rather than forcing the pace. This tactic stood him in good stead as he was able to save enough energy to fend off many challenges in a frantic finish to place 8th on the day and a splendid 2nd in the overall series. Alex’s twin brother, Thomas, returned to cross-country racing on the back of a successful indoor campaign which saw him win the South-West U20 1500m title and the bronze medal in the Midland Counties 800m, and produced his best run of the winter to place 26th in the U17 event. Another City runner to save his best race of the season for this, the only fixture to feature all of the top runners in the UK, was Richard de-Camps. Racing over 12km over cross-country for the first time, de-Camps confirmed his position as the county’s Club’s leading performers in 2013 to place 142nd in the senior men’s event. Club-mate Mike Mansfield acquitted himself well at this level to finish in 269th position. The Gloucester club’s younger runners also reaped the rewards for the hard work they have put in this winter under the guidance of their coach, Kerry Newell. William Staddon was the first Gloucestershire runner home in the U15 Boys race, in 160th place, whilst Bethan Moor put in another typically gutsy performance to finish second county runner in 127th in the U15 Girls race. The club’s youngest competitor on the day, Harry Wells, showed great determination on a demanding course to place 241st in the U13 Boys event. 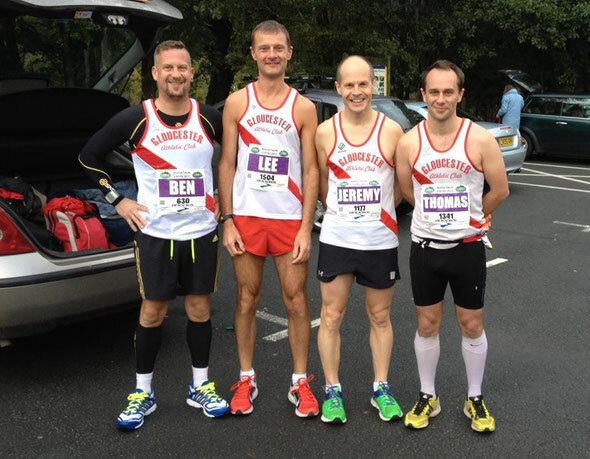 Gloucester Athletic Club members were busy racing in Half Marathons at the weekend. In the Bath Half Marathon, Mike Mansfield placed 113th in 77:58 whilst Kerry Newell placed 1196th in 98:07. 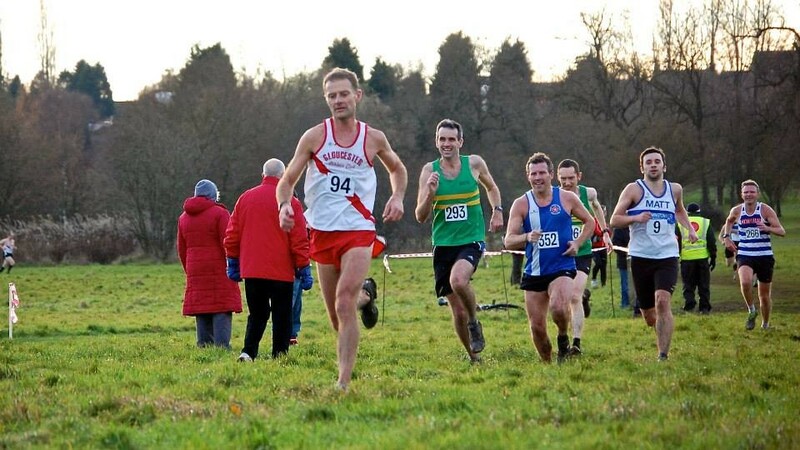 Gloucester Athletic Club’s Paul Barlow returned to his home region to contest the Northern Counties Masters Cross-Country Championships at Warrington on Saturday (2nd) and won the bronze medal in the M40 category. Gloucester Athletic Club’s senior men’s team finished just outside the medals when they placed fourth in the County 4 x 3-miles road relay championships at Sandhurst on Saturday (2nd).Ian Summers gave the team a solid start with an 18:53 leg, handing over to Tom Randles who recorded 19:05. Matt Powell then ran 18:05 on leg three before Steve Millward brought the team home in fourth with a scintillating 16:21 leg. Gloucester Athletic Club’s Rose-Anne Galligan fully justified her selection for the Ireland team at the European Indoors Championships in Gothenburg, Sweden. After winning her heat on Friday in 2:03.62, Galligan took her place on the starting line of Saturday’s semi final where she was placed fifth in a new indoor personal best 2:02.84, knocking half a second off the time she set the previous week in Athlone. Gloucester Athletic Club’s Rose-Anne Galligan has been selected to represent Ireland in the 800 metres at this weekend’s European Indoors Championships in Gothenburg, Sweden. Galligan had produced some recent sold performances over 1500 metres indoors but a particularly impressive run over her preferred 800 metres in Athlone on Saturday, where she reduced her indoors personal best time to 2:03.39, was the race that earned her a place on the plane. The women’s heats take place on Friday evening, 17:40 local time. In the last of the 2012-13 winter Pomphrey Sports 5km road races in Bristol, Arthur Daley ran 20:04 to take the M60 prize for the race and the series. Nicola Hovey clocked 24:08 to place 2nd in the W45 category. Gloucester Athletic Club’s Jeremy Mower place third overall and first Welshman in the Barry 40 mile track race in south Wales on Sunday (24th). Despite a strong cold wind that made the temperatures feel like close to freezing, Mower’s time of 4hrs 56:40 was a new personal best and his first time inside five hours. Mower is now looking forward to representing Wales in the UK 100km championships at Perth, Scotland, at the end of March when, hopefully, he will be setting a new record for international appearances for an individual from any country in the event, with nine. Simon Fortnam gave further evidence that he is steadily regaining the form and fitness that made him one of Gloucester’s top road runners when he placed 49th in Sunday’s Bourton 10km Road Race in 36:57. Fortnam missed all of the 2012 season due to injury and only returned to racing a matter of weeks ago, but is showing that he is rounding into reasonable shape in time for the spring road relays. Matt Powell continued his recent rich vein of form as he finished in 64th place in 38:10, a personal best for the distance by 10 seconds. Behind Powell, there was a host of personal bests by City runners as James Head knocked over one minute off his best as he finished 108th in 39:39. Arthur Daley ran his fastest time for nearly 20 years, clocking 39:59 to win the M60 category, whilst fellow coach Kerry Newell took over one minute off her best when clocking 43:10. Denise Evans was another to reduce her personal best, recording 44:54 to take second place in the LV50 category, two seconds and one place ahead of Nicola Hovey whose 44:56 was an improvement of over four minutes on her previous best. Dave Spackman placed 236th overall in 45:05. In the Castle Coombe 10km road race, Hayley Winters reduced her personal best by 40 seconds when recording 40:36. Competing in his first ever race, Nasdeep Purewal ran 7.73 seconds to place second in his 60 metres heat at the Midland Counties Open Meeting at the National Indoor Arena, whilst Kate Davies set a new personal best for the high jump when she cleared 1.60 metres at the same meeting. Gloucester Athletic Club’s Rose-Anne Galligan returned home to her native Ireland to compete in the Irish National Indoor Championships at the new Athlone IT Arena. Galligan placed 4th in the final of the women’s 1500 metres in 4:17.91, just outside the qualifying standards for next month’s European Indoors Championships. The Midland Indoors Open meeting at the NIA in Birmingham on Sunday (17th) saw Alex and Thomas George go head to head against each other for the first time indoors. Racing in the 1500 metres senior race, both set new personal bests as Alex won in 3:59.40 and Thomas placed 3rd in 4:02.64. Their training partner and club mate, Richard De Camps, finished in 4th place in 4:06.17 after leading the field through the first 1200 metres. Andrew Bowers placed 3rd in his heat of the U20 200 metres in 25.24 seconds and 3rd in his 400 metres heat in 55.31 seconds. Jeremy Mower and Matt Powell were Gloucester Athletic Club's only representatives in the Severn AC Five Mile road race at Sandhurst on Saturday (16th). Both runners showed excellent early season form on the road as Powell lowered his personal best by over 20 seconds, placing 7th in 30:23. Mower had a particularly promising run ahead of next week’s Barry 40-miles track race, placing 4th in 28:59, his fastest time since 2005. Two of Gloucester Athletic Club’s youngest members made their indoors debuts at the National Indoor Arena in Birmingham recently. Tamsin Doran and Eire Rowland-Evans, who are both members of Carlton Blake’s multi-events group, competed in the U13 Girls category of the Midlands Quadrathlon Championships and both came away with a series of personal best performances. Tamsin set three new Club U13 Girls club records in the long jump (3.00m), shot putt (6.20m) and the Quadrathlon (780 points) on her way to placing 21st overall, whilst Eire placed 30th. In the Wokingham Half Marathon, Nathan Smith placed 180th in 85:02. 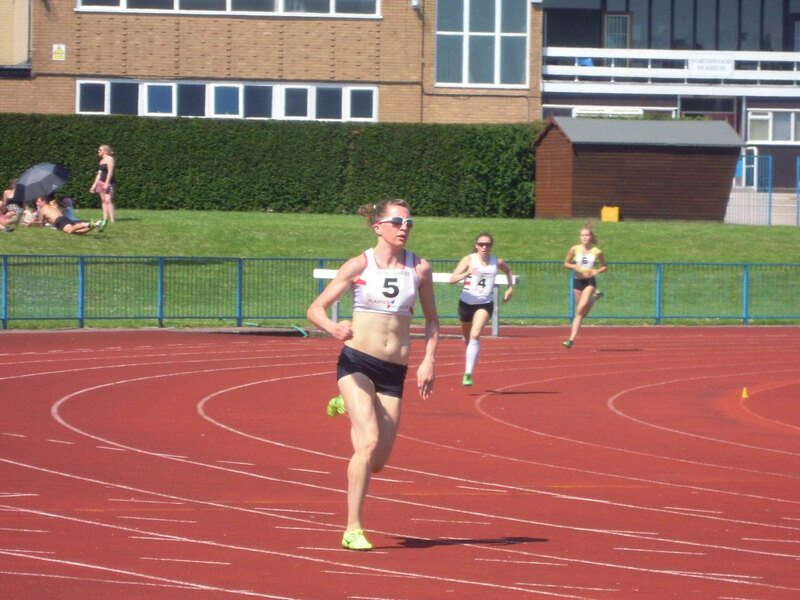 Gloucester Athletic Club’s Rose-Anne Galligan placed fourth in the final of the ladies 1500 metres at the British Athletics European Trials & UK Championships in Sheffield on Sunday (10th) in 4:20.52. 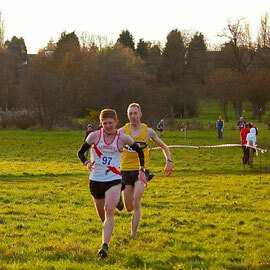 Gloucester Athletic Club’s senior men’s cross-country team failed by the narrowest of margins to win promotion to the top flight in the Birmingham Cross-Country League when they placed 4th team in the final Division Two fixture of the season at Pittville Park in Cheltenham on Saturday (9th). Heading into the race, the Gloucester squad was locked in a three-way battle with Telford AC and Cannock & Staffs, with all three having a realistic chance of gaining the third promotion place behind the City club’s neighbours Severn AC and the Warwick University squad. Despite another strong turn-out that has been the hallmark of the season, Gloucester failed by just five points and face another season in Division Two next winter. However, the whole squad rallied to captain Omar Alim’s call and raised their game on Saturday. The ever-consistent Richard De Camps led the team home again in 9th position, just one place ahead of team-mate Steve Millward. Paul Barlow was the next City runner to cross the line. Having only returned that morning from a business trip in Sweden where the temperatures had dropped to -28 degrees, he finished a highly credible 23rd. Jeremy Mower was next in, in 50th place, just holding off Mike Mansfield who placed 53rd and Simon Fortnam who, in 55th place, showed that he is gradually regaining his fitness after 12 months on the sidelines through injury. The team’s total of 200 points placed them fourth on the day and a season’s total of 805, but Telford scored 189 points on the day to record a season’s total of 800 points just five better than Gloucester, to secure the third promotion place. In the ‘B’ team competition, the City squad also placed fourth to finish the season in 2nd place. Junior Dan Steel finished his first full season in style, leading the team home in 79th place. Nathan Smith put in another solid performance to place 96th and with Matt Powell finishing 111th, Ian Summers 121st, Omar Alim 133rd and Matt Wade 134th, the team scored 674 points on the day to finish with a season’s total of 2223. Evergreen Arthur Daley again belied his years to place 136th, Simon Barnes placed 153rd, Paul Nash 157th, Merlin Tolley 166th, Nick Bishop 179th and Paul Loveridge 190th. Gloucester Athletic Club’s Andrew De Camps won the Midlands Senior Indoors 800 metres title at Birmingham’s National Indoor Arena on Saturday (9th). After qualifying comfortably from his semi final, the former Midlands outdoor champion turned on the heat to win the final in a season’s best 1:56.31. De Camps’ training partner, Thomas George, knocked an astonishing six seconds off his personal best 800 metres time when winning the bronze medal in the U20 Men’s event in 1:58.34, his first time under two minutes. Next week, he will go head to head against his twin brother Alex for the first time indoors over 1500 metres. Dominic Tutton was another Club runner to lower his 800 metres personal best at the Championships. He won the silver medal in the U17 Men’s event in 2:00.96, an improvement of two and a half seconds on his previous best. Heptathlete Kate Davies had a busy day, competing in no fewer than five events. Davies placed second in the 800 metres in 2:33.45, 8th in the 60m Hurdles in 10.57 seconds, 3rd in the high jump with a clearance of 1.55m, 5th in the long jump with 4.60m and second in the shot putt with 9.08 metres. Julian Richardson lowered his personal best for 60 metres indoors when recording 7.69 seconds in the U17 Men’s event. Thomas and Alex George both represented Marling School in the King Henry VIII Schools cross-country relays at Coventry where Alex recorded the fastest leg of the day. Gloucester Athletic Club sent a small team to compete in the final Gloucestershire Cross-Country League fixture of the winter at Plock Court on Saturday (2nd). Despite the bright, sunny conditions, the going underfoot was very heavy and did not suit the more fleet of foot runners. However, Jeremy Mower relished the conditions as he returned his most satisfying League performance of the season, finishing in 18th place in the senior men’s event. Next to finish was Nathan Smith who, in his first race of the year following a short lay-off, placed 51st. Matt Powell continued his progression over the cross-country by finishing in 62nd, with team captain Omar Alim crossing the line in 84th place in his first race since injury. Seasoned veteran Arthur Daley was next home, in 89th place, a position that was good enough to secure him first place in the M60 category for the overall league season. Simon Barnes completed the scoring six, in 94th place. In the senior ladies race, Emma Jeffery placed 56th in her first team race for two seasons whilst in the U15 Girls race, Abi Pearce achieved her highest-ever league placing when finishing 4th. There was success for Harry Wells in the U13 Boys race as his 4th place in Saturday’s race gained him 2nd overall in the League. The U13 Girls race was notable for the league debuts of Alidia Vaile and Jude Dowdeswell. Both members of Carlton Blake’s developing multi-events squad at the Club, they placed 24th and 25th respectively. Despite not racing in this final fixture, due to a clash of dates with the South-West schools championships, Alex George won the individual league title in the U17 Men’s category and Will Staddon took 3rd place in the U15 Boys age group. Gloucester Athletic Club was well-represented at the South-West Schools Cross-Country Championships at Blaise Castle on Saturday (2nd). In the Senior Boys race, Alex and Thomas George both produced strong runs and finished in the top 10, with Alex finishing a close second and Thomas eighth whilst their training partner Ryan Hearn placed 25th in the U17 Boys race. Alfie Crouch was the Club’s youngest representative in the boys events and placed 46th in the U13 race while in the U15 Girls race, Bethan Moor placed 31st. Gloucester AC’s Julian Richardson made an impressive indoors debut in the Birmingham Games at the National Indoor Arena on Saturday (2nd). He recorded a time of 7.72 seconds in his heat of the U17 Men’s 60 metres before taking seconds place in his heat of the 200 metres with a new personal best time of 24.41 seconds. Multi-eventer Kate Davies clocked 28.09 seconds in her heat of the U20 Ladies 200 metres before recording 9.23m in the shot putt and 2:38.42 in the 800 metres. Andrew Bowers clocked 55.64 seconds in his heat of the U20 Men’s 400 metres. In the second indoors race of her European mini-tour, Gloucester’s Rose-Anne Galligan placed 3rd in the 1500 metres event at the Vienna Indoor Classic in 4:14.53. In the latest event in the Pomphrey Sports 5km road race series in Bristol, Arthur Daley finished 44th overall and first in the M60 category in 20:29, Nicola Hovey finished 62nd overall and 3rd W45 in 23:09 and Vanessa Anderton placed 98th in 35:35. Gloucester’s Irish international, Rose-Anne Galligan, showed that she is over the virus that laid her low over Christmas when winning the ladies 800 metres at the Elan Open Meeting in Bratislava, Slovakia, on Sunday. Galligan’s winning time was 2:05.71, a season’s best. Gloucester Athletic Club’s Dominic Tutton won the silver medal in the Welsh U17 Indoors 800 metres Championships in Cardiff on Saturday (26th). After sitting in 3rd place for the first half of the race, Tutton made his move and hit the front with 200 metres remaining. His lack of recent training took its toll and he was overhauled in the final 50 metres, but held on for second place and a new indoors personal best time of 2:04.07. Tutton’s Gloucester club mate Thomas George won the Open U20 Men’s 1500 metres race at the Cardiff Indoor Arena on Sunday (27th). Content to sit with the leading group until the final 200 metres, the Gloucester youngster put in a scintillating burst of speed that put 10 metres between him and the rest of the field which he maintained to the finish. George’s winning time was 4:11.19. Gloucester Athletic Club’s Alex George, was also on the medal podium at the Midlands Cross-Country Championships at Stafford on Saturday (26th). An overnight snowfall on the Friday gave the course a good covering but this soon turned to slush, making conditions underfoot very soft. George was well-placed throughout and at the half way stage found himself and Birchfield’s Abdi Abdi well clear of the field. However, whilst the Birchfield athlete made light of the conditions, George struggled but held on for a clear second place. 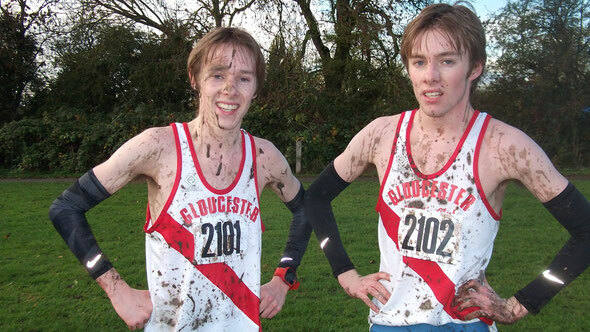 Gloucester Athletic Club’s Alex and Thomas George braved snowy conditions to compete in the Cardiff cross-country meeting on Sunday (20th). In the McCain’s UK Cross Challenge race, Alex chose not to go with the pace set by series leader Jac Hopkins of Swansea Harriers, deciding instead to stay with the chasing pack. With one mile remaining, the Gloucester youngster made his move and established himself in a clear second place which he held to the finish line. The result moves him up to second place in the overall standings, which he hopes to consolidate in the final race in Birmingham next month. Thomas ran for Gloucestershire Schools in the U20 men’s race and was the first Gloucestershire runner home, in 18th place. The Gloucestershire team won bronze medals in the team event. Gloucester’s new Blackbridge Jubilee Athletics Track has taken a massive step towards being able to stage full athletics meetings by being granted a basic-level competition licence by UK Athletics. The UK Athletics certification means that meetings can now be held on the new facility. The track is currently busy four days a week with training sessions and bookings are already being taken to stage events during the spring and summer months. For more details, contact Bob Purcell on 07598 107422. Gloucester Athletic Club’s Thomas George won the South-West England U20 Men’s 1500m title at Cardiff’s National Indoor Arena on Sunday in 4mins 06.02 seconds. 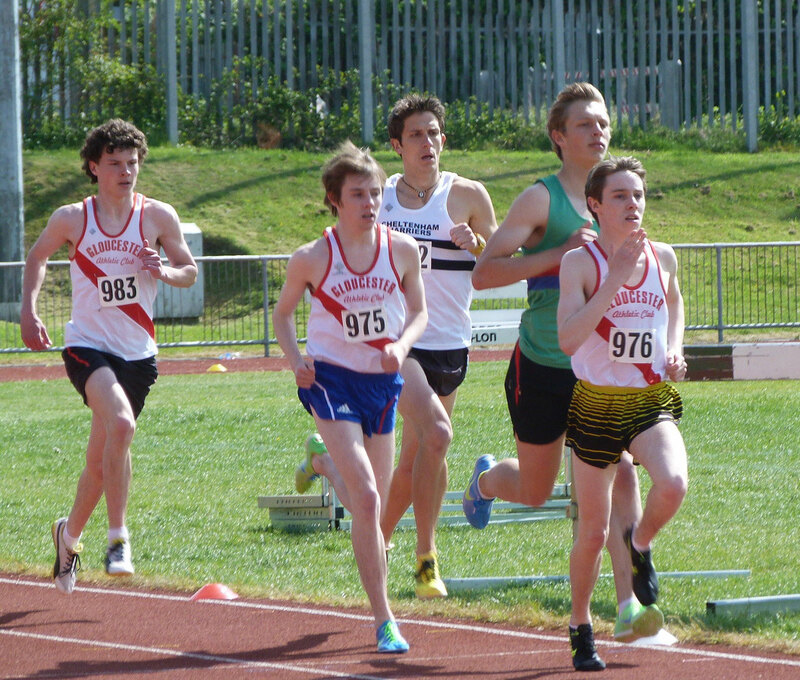 Gloucester Athletic Club’s Dominic Tutton finished 6th in the U17 Welsh Champs 3000m in 9min 54secs. In the Midland Counties Open Throws Meeting at Birmingham on Sunday, Gloucester AC’s Jacob Lange threw a personal best 52.18m for the 6kg Hammer for second place. The result moved them up to fourth place overall in the division, just 21 points out of the promotion places, and with one fixture remaining, leaves them with a fighting chance of gaining promotion back to the top flight. Alim’s goal this winter has been to field as many runners in each race as the Club could manage and whilst Saturday’s turn-out was slightly lower than the giddy heights achieved in the previous fixture, the City Club still managed to have 14 runners lining up at the start of the 9.5km event. Gloucester’s leading runners this season have been Steve Millward and Richard De Camps who have both finished in the top 10 of each League race. They continued this trend on Saturday as Millward, showing few signs of the bug that had laid him low earlier in the week, finished in 6th place with De Camps just behind, in 8th. Paul Barlow continued his good form, finishing as the team’s third scorer in 22nd, while Jeremy Mower placed 44th. Mike Mansfield, like Barlow another recent addition to the squad, was next home in 51st and the scoring six was made up by Tom Randles who came home in 53rd place. The team’s score of 184 points was their best of the season. Simon Fortnam and Wayne Mayer led the ‘B’ team’s challenge. They were locked together for much of the race, with Fortnam eventually prevailing by the narrowest of margins to finish in 60th with Mayer just behind in 62nd. Matt Powell continued his recent run of good form by finishing in 99th place with another 2012 newcomer, Max Sheppard securing 114th place. Ian Summers was next to finish, in 121st place and Merlin Tolley finished in 146th place to secure second place for the ‘B’ team. Team stalwarts Humphrey Phillips and Andy McKenzie placed 185th and 203rd respectively. Afterwards, Alim was in a buoyant mood. “This was a totally unexpected result as we were missing several runners due to a virus that has swept through the Club this week. We need to monitor Richard De Camps’ groin injury over the next couple of weeks, but expect him to be fully fit for the final race at Cheltenham next month. 6th Steve Millward; 8th Richard De Camps; 22nd Paul Barlow; 44th Jeremy Mower; 51st Mike Mansfield; 53rd Tom Randles; 60th Simon Fortnam; 62nd Wayne Mayer; 99th Matt Powell; 114th Max Sheppard; 121st Ian Summers; 146th Merlin Tolley; 185th Humphrey Phillips; 203rd Andy McKenzie. A 1st Severn, 88 points; 2nd Warwick Uni 142; 3rd Gloucester 184. B 1st Warwick Uni 425 points; 2nd Gloucester 602; 3rd Knowle & Dorridge 628. Gloucester Athletic Club members produced some encouraging performances in the County Cross-Country Championships at Blackbridge on Saturday (5th). In the senior men’s event, Richard De Camps ran a well-judged race to place 4th behind the talented trio of the Russell brothers from Stroud and Cheltenham’s Dave Roper. “I knew those runners were the class act in the field, so I chose to bide my time and hang on for 4th place, rather than mix it and pay the consequences”, said the Forester. Mike Mansfield was the next City runner home, finishing in 19th place and 1st M40, just ahead of his team-mate Jeremy Mower, who placed 24th and 3rd in the M45 category. Gloucester Athletic Club’s youngsters were in fine form at the County Cross-Country Championships at Blackbridge on Saturday (5th). Leading the way was Alex George, who was untroubled as he strode to an easy victory in the U17 Men’s race. 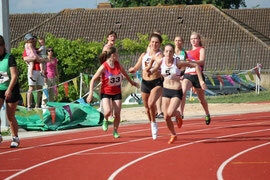 In the U17 Ladies event, heptathlete Kate Davies, in a rare outing over the country, took an unexpected second place. Will Staddon carried his improved form from 2012 into the New Year, as he finished just outside the medals in 4th place in the U15 Boys race, while the U15 Girls took team bronze in their race. Led home by Bethan Moor in 3rd place, Abi Pearce finished 11th and Heather Christie 14th in her first County championship event. Harry Wells placed 6th in the U13 Boys race whilst in the U11 races, Elissa Moor placed 11th in the girls event and Jake Tombs and Ben Okuefuna placed 9th and 21st respectively in the boys event. The Gloucester club’s junior endurance group trains each Tuesday and Thursday from the Blackbridge headquarters, at 6pm. Matt Powell continued his good recent form in the Pilot Inn New Year’s Day Five Mile Road Race, leading the Gloucester contingent home in 11th place in 30:38, a personal best by 16 seconds. Hayley Winters was the first lady to finish, in 24th place, with 33:32 while Martyn Hobson was next to cross the line, 43rd in 37:01. Just behind, in 45th place, was Nicola Hovey whose 37:10 was the fastest she has clocked for five miles. Rachel Fake finished in 52nd place with 39:50 and youngster Heather Christie recorded 45:29 in 78th place to win the U17 Ladies category.